There’s a Yoga for nearly every occasion. In the past year alone, we’ve reviewed no fewer than six different models (including the Yoga 2 Pro), and that’s not to mention the tablets. 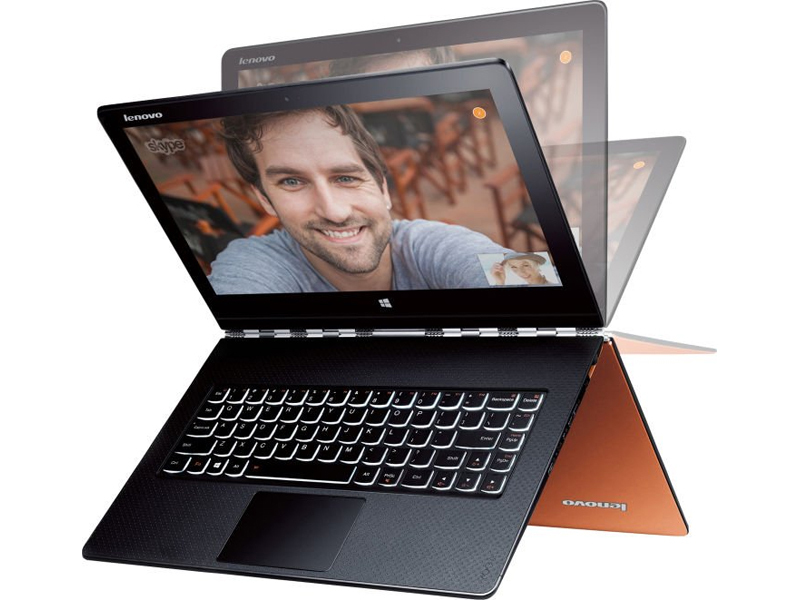 It’s no surprise: convertibles satisfy a valuable segment straddling the line between tablet and notebook. And as chipsets become more and more efficient, these devices manage ever-thinner profiles—making them even more enticing for those who need a tablet and a notebook. 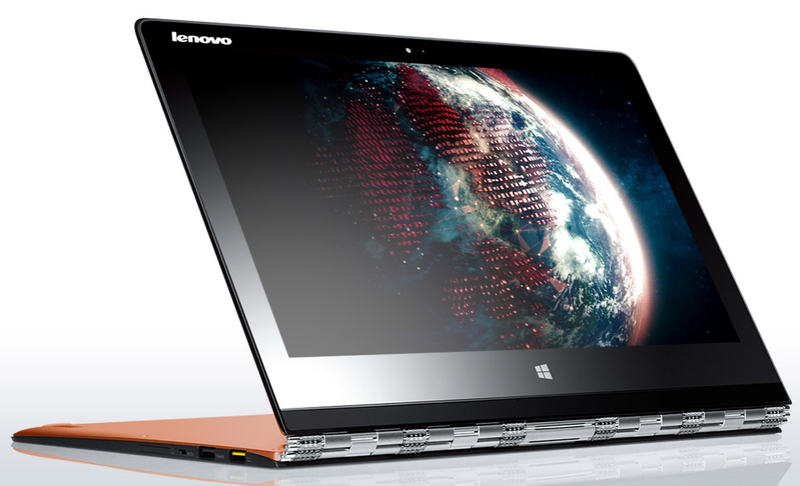 And that’s just the story with the $1,300 Yoga 3 Pro. Packing an Intel Core M-5Y70 CPU (clocked at 1.1 – 2.6 GHz), this is the first convertible to feature a Broadwell SoC, whose 14 nm manufacturing process with three-dimensional FinFET transistors promises greater efficiency than ever before and a notably smaller die size to accommodate thinner devices. 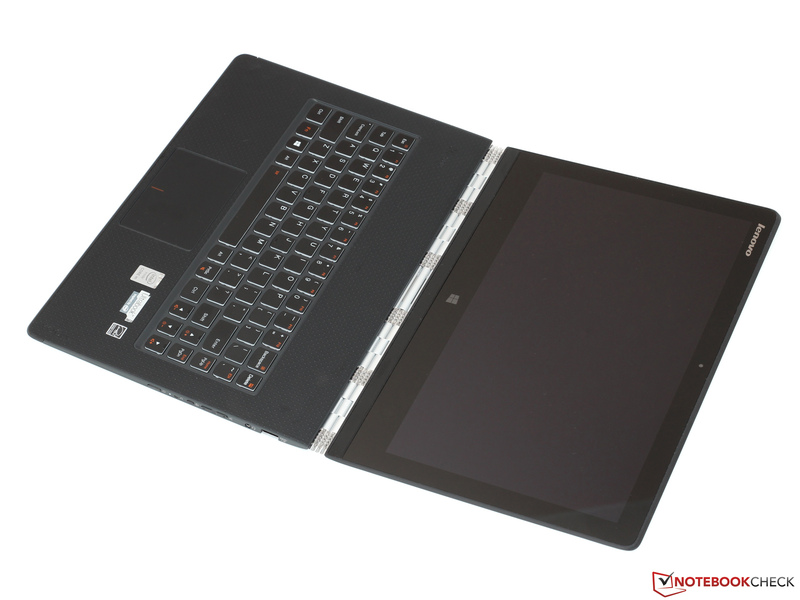 Consequently, the Yoga 3 Pro is seemingly impossibly compact in the world of 13.3-inch notebooks. Elsewhere, we find no compromises on paper: our review unit includes 8 GB of LPDDR3 RAM, a 256 GB SSD, and the same QHD+ resolution of 3200x1800 as its predecessor. 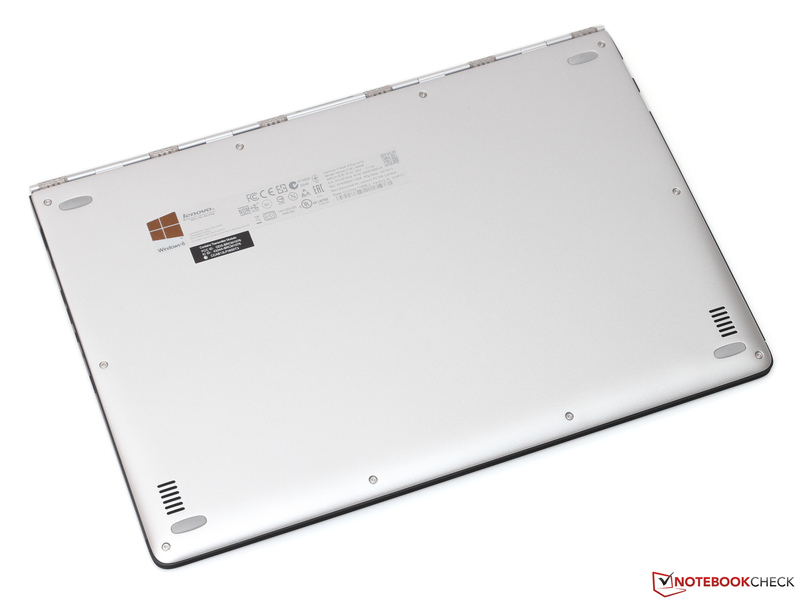 If spec sheets were all that mattered, the Yoga 3 Pro would be an instant winner. 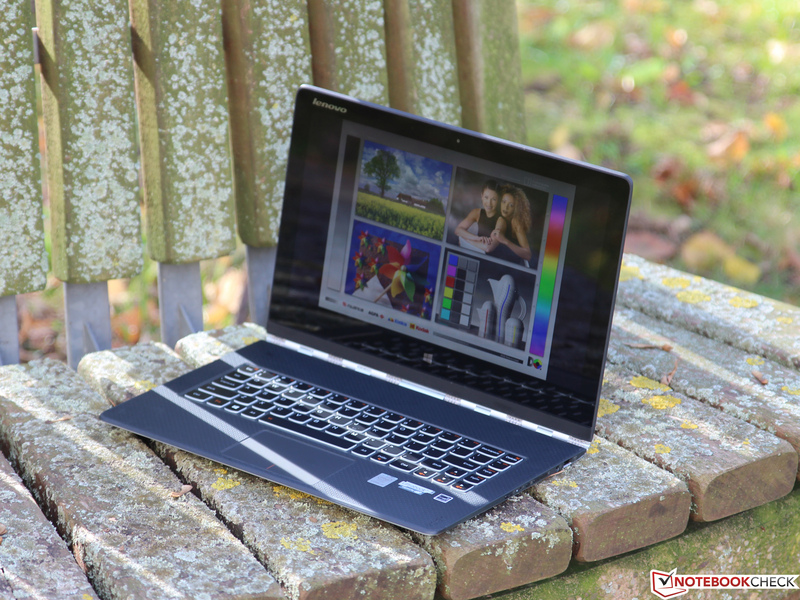 But there’s more to mobile computing than the numbers—so, as we dive deep into our testing routines, can the Yoga 3 Pro live up to the lofty expectations accompanying it? ...thanks in part to the innovative hinge design. The Yoga 3 Pro is as flexible as ever. 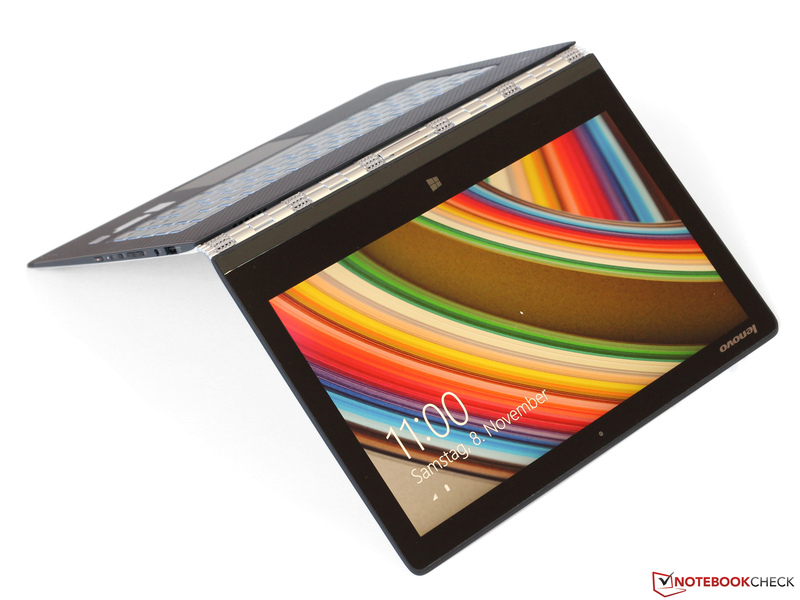 A few words that could be used to describe the Yoga 3 Pro’s design: striking, beautiful, clean, unique. Available in three colors (Light Silver, Clementine Orange, and Golden), this is a machine benefited by the experience of its veteran designers, with a case that is as comfortable as it is beautiful. The wedge-shaped body measures only 12.8 mm at its thickest point and weighs just 1202 g. That’s even smaller than the most recent Macbook Air 13 which we reviewed a few months back (1.4 kg, 17 mm). The machine feels unbelievably light in the hand—it truly is impressive. Fortunately, in spite of the lightweight construction, the machine still feels mostly rigid and durable. 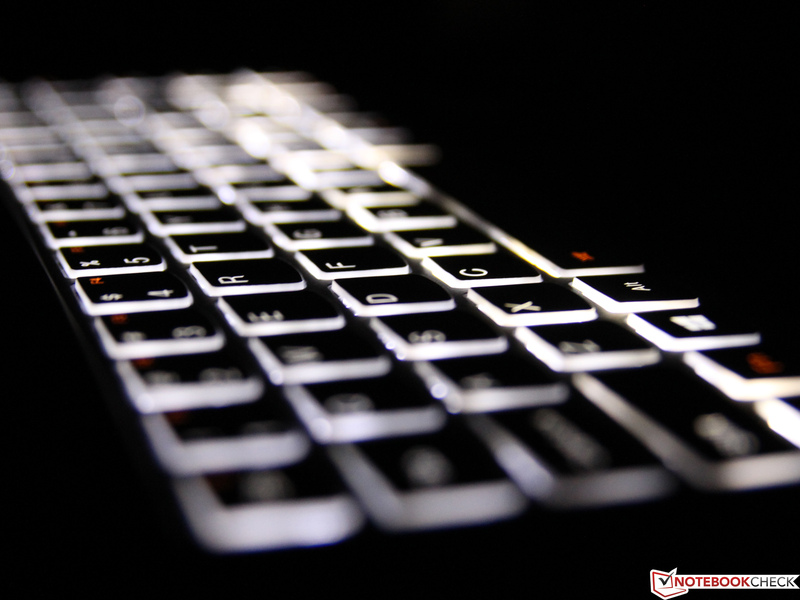 Although twisting is possible near the bottom around the touchpad with moderate force, it takes a very specific effort to provoke this weakness. The thin metal casing also allows almost no flex on the base unit while it is resting on a surface such that sturdiness under daily use should be no concern. This is thanks in large part to the machine’s tiny rubber feet which only lift it ever-so-slightly above the surface on which it’s resting. 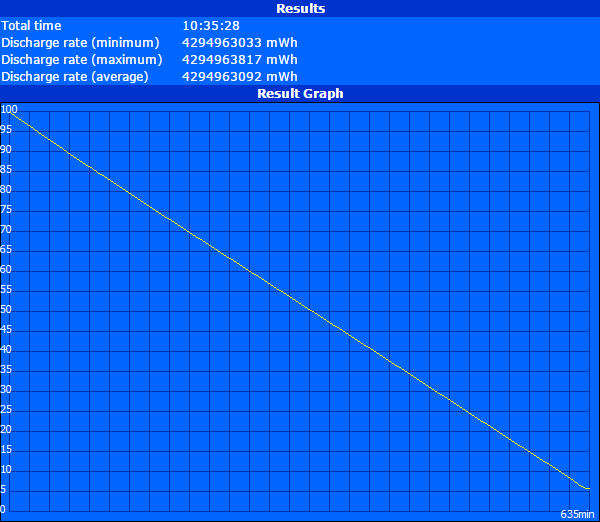 Unlike most Ultrabooks, this is possible thanks to the complete lack of air intake grates on the bottom of the machine. Instead, the device breathes through tiny vents hidden away near the hinge at the top-right of the base unit. Broadwell’s influence is felt here. The perilously-thin display lid, while also lined with metal, is a bit less reassuring. Although it certainly seems to provide ample protection while the lid is closed against the base (which will be the case in transit), its resistance to distortions from rear pressure is rather low. Likewise with torsion resistance, which—while not terrible—is easily tested by only moderate twisting of the lid. Clearly, some sacrifices in terms of durability were necessary to achieve the as-yet unmatched portability of the Yoga 3 Pro. 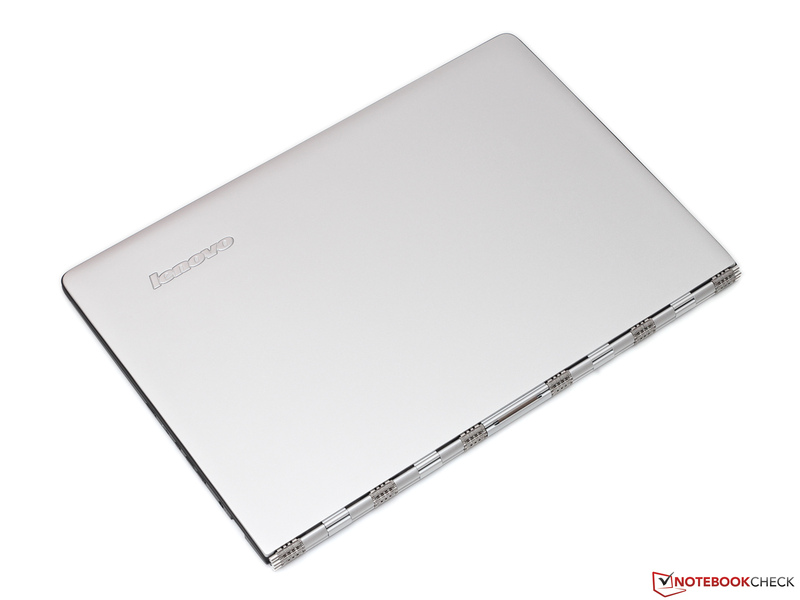 The new hinge design, on the other hand, which Lenovo claims is also partially responsible for the slim casing, seems to do its job perfectly well. It consists of a series of watchband-like strips of woven metal which is not only attractive and unusual in its appearance but also quite practical in terms of its functionality. While there is still some display wobble in play when the screen is tapped, typing only provokes very slight vibrations. This is appreciated in light of the inclusion of a high-gloss display, where dancing reflections are a perpetual struggle. The hinge, of course, provides for 360-degree rotation of the screen, so that the unit can be used in four different modes: Laptop, Tent, Stand, and Tablet Modes. 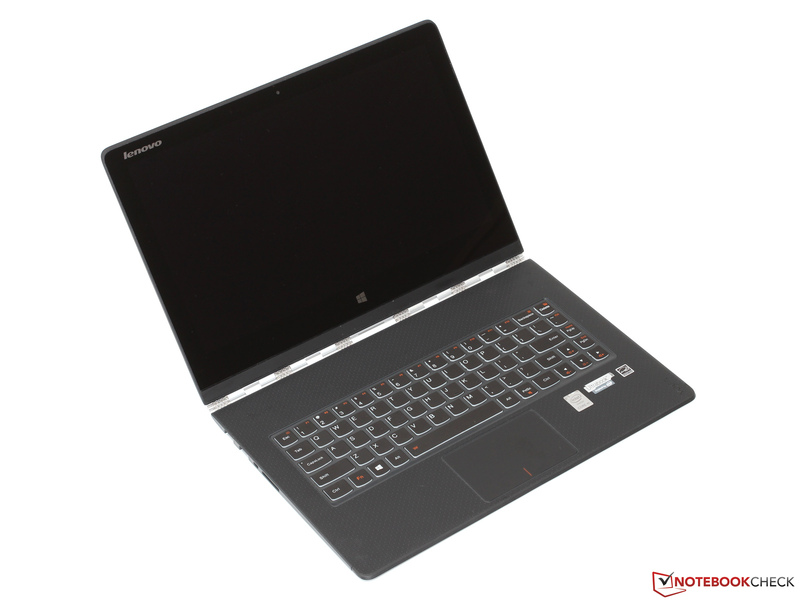 For more about these options, please see any of our previous Yoga reviews; in the case of the Yoga 3 Pro, we found no problems operating in any of them, and barring a few exceptional circumstances, we found transitioning between the various modes quick and seamless. One annoyance with regard to the hinge and lid design is the difficulty of opening the machine while closed: it’s not only impossible to do with one hand, it’s difficult even with two. Apart from the relative fragility of the display lid, the only other complaints we have as to the Yoga’s design are minor indeed. Workmanship is excellent overall, with parts fitting closely and consistently in most cases and smart revisions to correct previous mistakes detectable throughout to the trained eye. For instance, the front edge of the unit along the bottom of the palm rest features a dull strip of protective rubber for when the unit is used in Tent Mode. However, this strip is also contoured in such a way that it is incredibly gentle to resting wrists—so none of that sharp metal (or plastic) edged discomfort that you’ll find in some competing models applies here. The only minor issue we found with this area regards the seam where the rubber palm rest meets the bordering strip; moving the palms downward on the rest results in a scraping sensation that is mildly disconcerting. Similarly, although we rather enjoy the soft, textured rubber finish used on the palm rest and extending to the keyboard surround, it does tend to be difficult to clean thanks to the tiny dimples in its surface. Maintenance is quite simple thanks to a removable bottom panel, under which you’ll find access to the WLAN/WWAN adapter, the large battery, the M.2 SSD, and the cooling fan, as well as other items such as the speakers. The only caveats here are the lack of replaceable RAM (which is soldered to the board) and the fact that the ten screws securing the panel require a Torx bit—something which is easily acquirable, but which many people don’t have lying handily around their house. 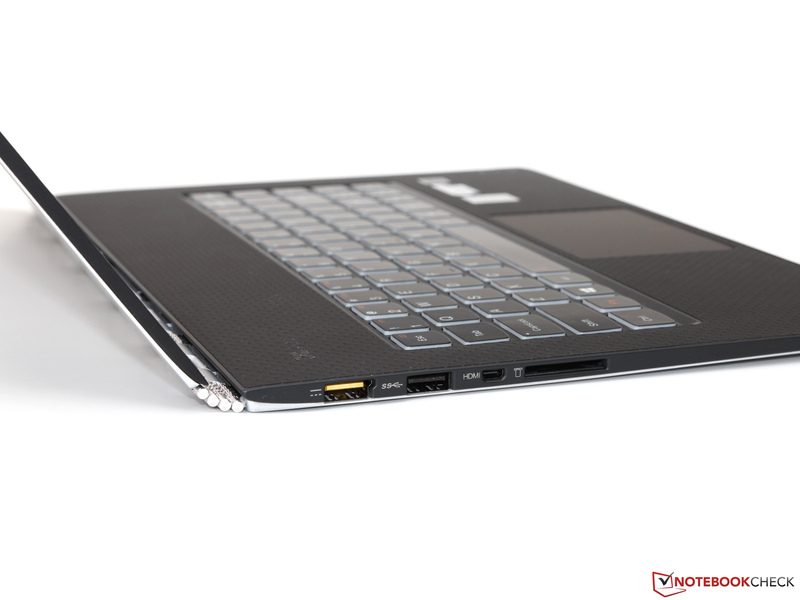 Amazingly, in spite of its thinner casing, the Yoga 3 Pro manages to include more ports than any of its predecessors, with not two but three USB ports (two USB 3.0 and one USB 2.0), as well as the usual array of supplemental selections (including mini-HDMI for video output and a much-appreciated SD card reader). The black magic responsible for this improvement is the new charging port, which doubles also as a USB port. 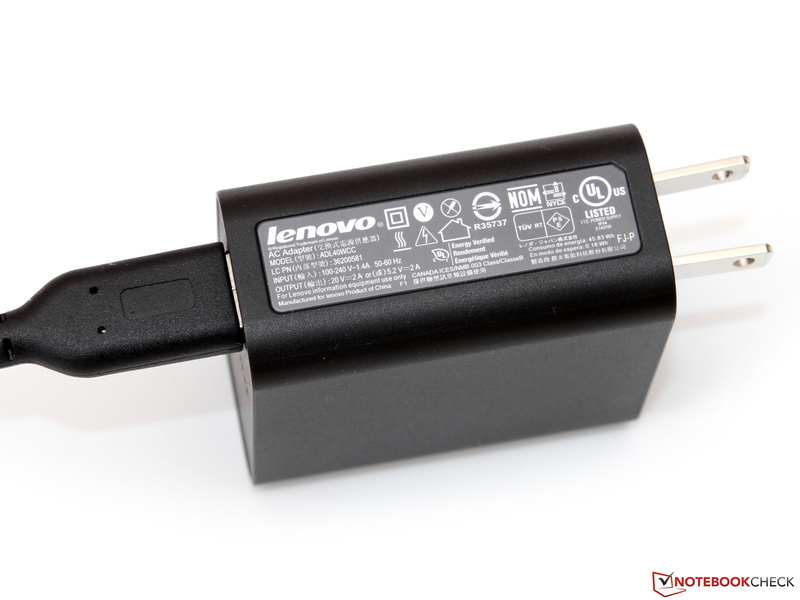 The downside, of course, is that you will yet again need a new charger if you’re upgrading from an older Lenovo machine (that would be the second design change in a few years in case you’re keeping track). Port placement is convenient and sensible, with all ports (and buttons) lining the left and right edges of the unit, positioned near the rear for easier access and to keep them out of the way during use. 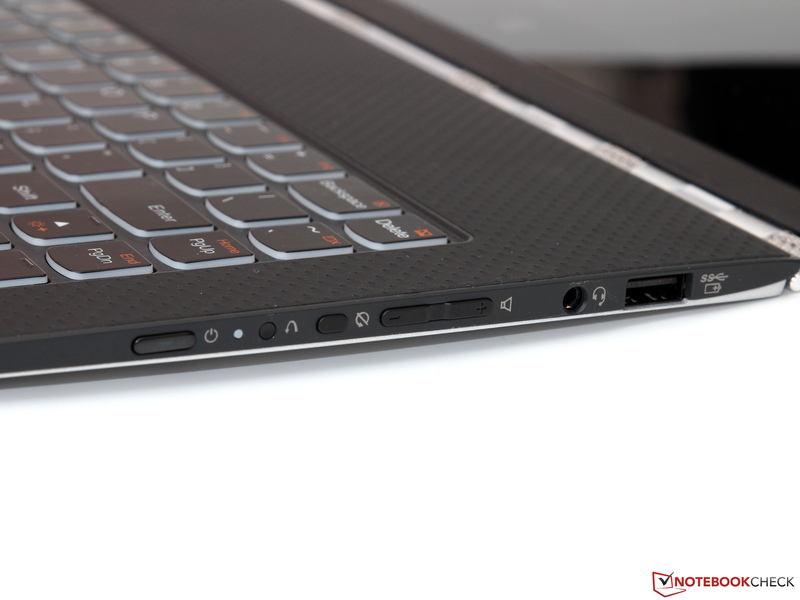 The USB ports on the left side (one of which is also the charging port) are separated by a healthy 10 mm or so of space, which allows for most larger connectors to reside adjacent to each other without problems. 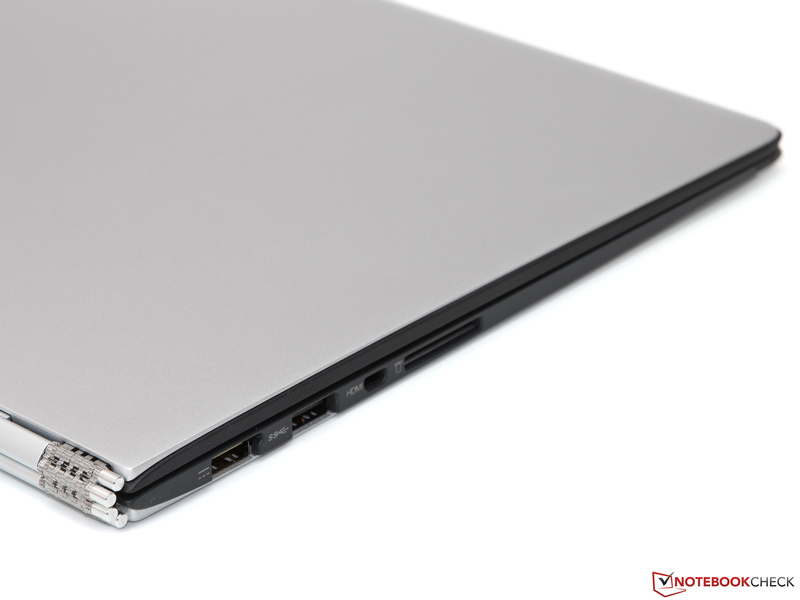 For all its positives, you might be able to guess the biggest problem with the Yoga 3 Pro’s connectivity: that the thin casing and lack of elevation above the surface (due to the aforementioned tiny rubber feet) leaves absolutely no space for larger devices, such as some USB flash drives. This is really just a fact of life rather than a design shortfall; as machines become ever-thinner, so will we need to find suitably leaner devices with which they can connect. 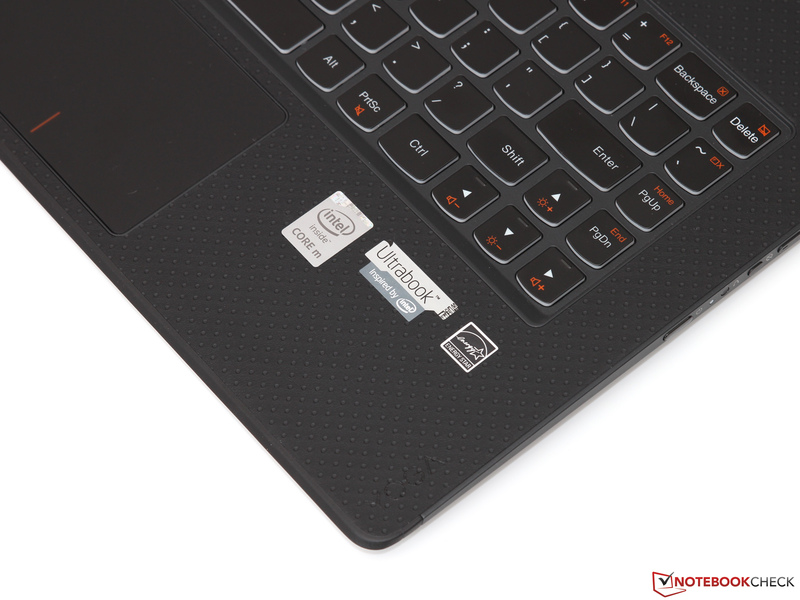 For wireless connectivity, the Yoga 3 Pro features a Broadcom BCM4352 802.11ac WLAN adapter, which handled connections to our ASUS RT-AC68U router with ease. 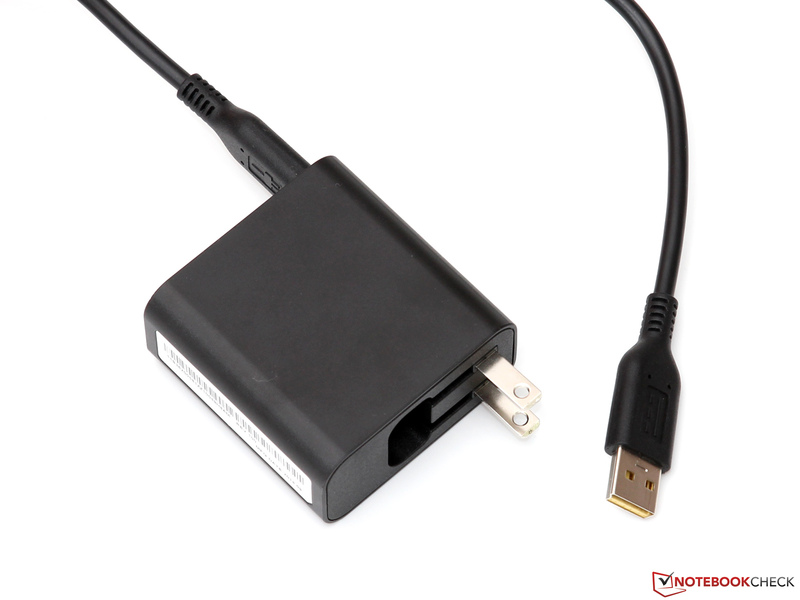 This is a dual-band, 2x2 adapter which managed good signal strength and speeds throughout our time with the notebook. It also features integrated Bluetooth 4.0. While connecting through a TP-Link Archer C7 router over 802.11ac wireless a few feet away, we measured an average transfer rate of 43.6 MB/s (350 Mbps), which is good even for a Wireless-AC connection. The integrated 720p webcam did a good job with skin tones and clarity; quality seemed superior to that of many competitors. It also interpreted motion well, absent of significant blurring. The Yoga 3 Pro ships with a small power adapter weighing just 192 grams, bringing the total carry weight of the notebook and the AC adapter to just 1394 g—still no more than the weight of the Macbook Air 13 alone. On the other hand, the power adapter’s cord length of just 6 ft could be better. 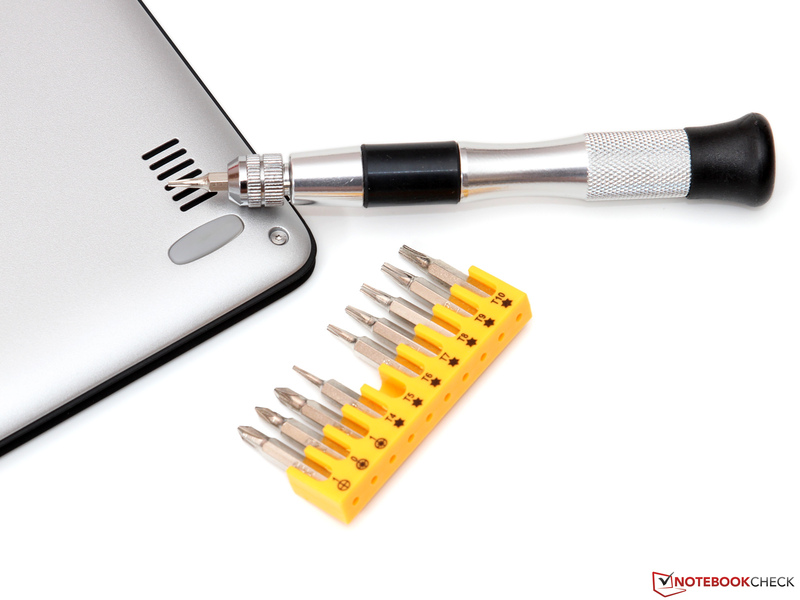 In terms of included software, the Yoga 3 Pro comes preloaded with a McAfee LiveSafe security trial, a small selection of preinstalled apps such as Zinio, Amazon Kindle, Evernote, and Yoga Chef, and Lenovo’s software package, which includes Lenovo Reach, OneKey Recovery, OneKey Optimizer, and Veriface Pro. 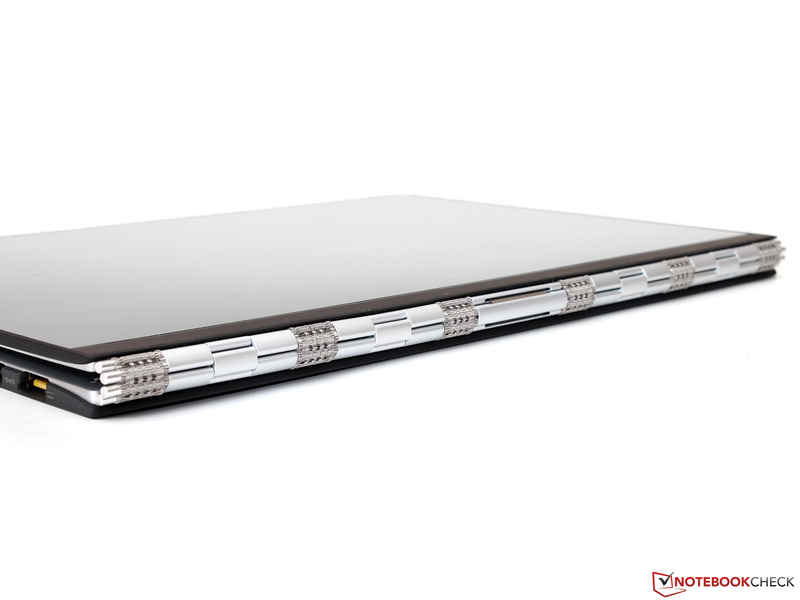 The Yoga 3 Pro ships with a standard one year depot warranty. As always, upgraded options exist for an additional cost through the manufacturer. 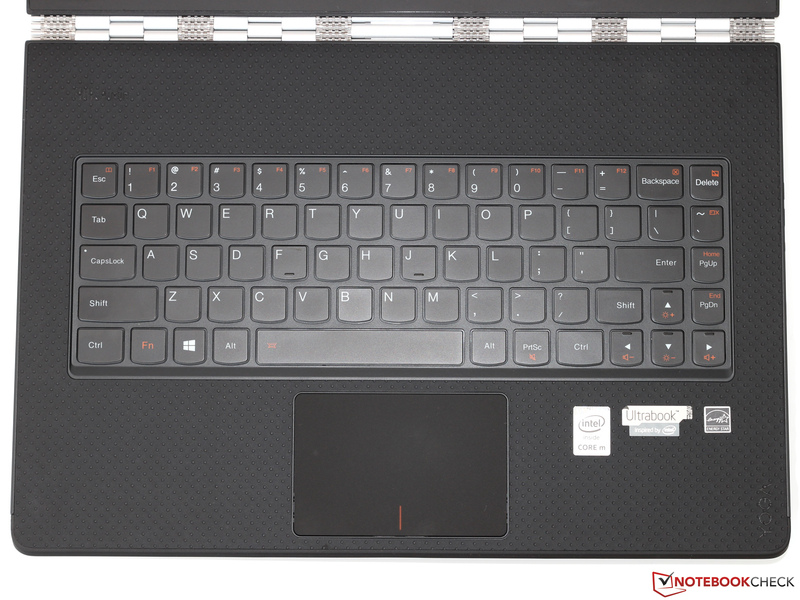 Our first thought when we witnessed the Yoga 3 Pro’s ultra-thin casing (apart from the thermal and durability implications) was how it would affect the keyboard. 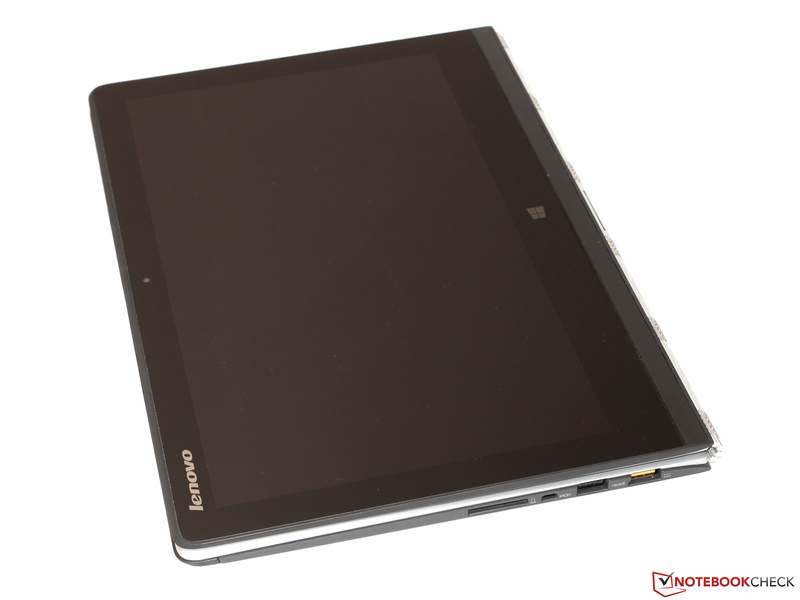 As predicted, key travel is fairly shallow, though it isn’t necessarily noticeably shorter than that of the Yoga 2 Pro. Fortunately, feedback is crisp, communicating strokes well and allowing for relatively worry-free typing following a brief adjustment period. The layout is still perhaps not the most ideal, with scrunched keys on the far left- and right-hand sides (Backspace, Enter, Tab), and a new caveat: a complete lack of F keys, which have now been relegated to mere secondary functions of the number keys. This omission of the top row of keys, by the way, appears to have been a necessary decision to provide room for the cooling fan, which is situated just above the keyboard within the machine’s incomparably thin case. However, neither of these layout problems is debilitating, and the keyboard overall is still quite comfortable. The keys are tightly-affixed and depress quietly enough without the clattery looseness of cheaper models. Backlighting was also somehow squeezed into the machine, though there are only two options: ON and OFF. It’s also a bit uneven on our model, with the bottom of the keyboard lighting up quite a bit more than the top. The Synaptics clickpad is comfortably large and (by our judgment) superior to that of even many modern ThinkPads, which more recently have been the subjects of a full-depression clickpad experiment of which many users have voiced strong resentment. 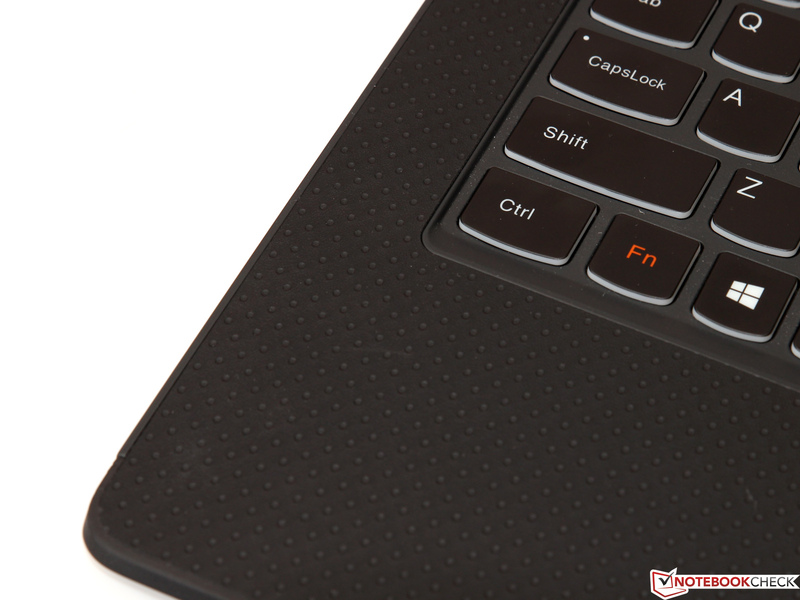 Unlike the ThinkPad clickpads, this model only features a clickable bottom region, much like that of other recent Yoga convertibles. It also experiences none of the pointer jumpiness upon clicks that its ThinkPad brothers suffer. Though it’s difficult to replace a good set of physical buttons, this is one of the better implementations of clickpad design that we’ve encountered to date. 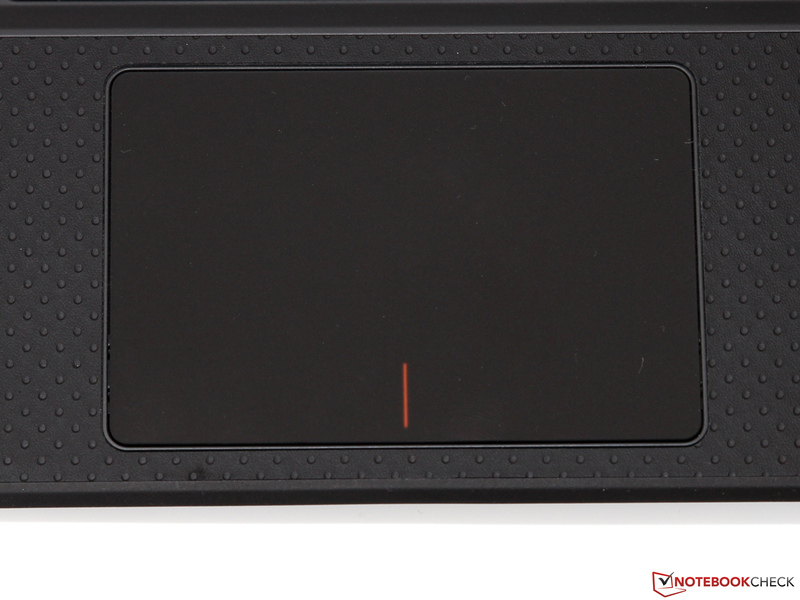 The touchpad also handles gestures well, with seamless two-finger scrolling and pinch-to-zoom operation. The smooth, matte finish grabs and forever holds captive fingerprints, but it is nevertheless quite nice to the touch. Finally, the Yoga’s touchscreen is as good as any we’ve spent time with to date. Everything from accuracy to input speed and gesture interpretation is handled well. The glass covering the LCD panel is so close to the actual panel that it provides a more natural sensation of touch interface than that of thicker designs; think mobile phone or premium tablet; that’s the sort of impression the Yoga 3 Pro’s touchscreen makes. Speaking of which, the Yoga 3 Pro features what is now becoming a fairly common trend in higher-end notebooks: a 13.3 inch 3200x1800 (QHD+) panel, which in this case factors out to a high pixel density of 276 PPI, making it fairly pixel-dense still by modern standards. 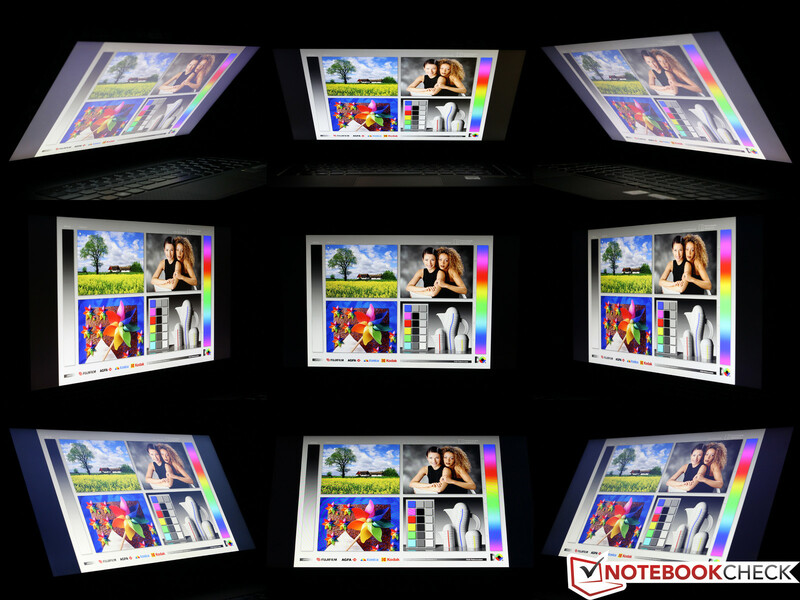 Subjectively speaking, the screen appears attractive and bright enough for any indoor use. Colors also appear pleasant and relatively deep. 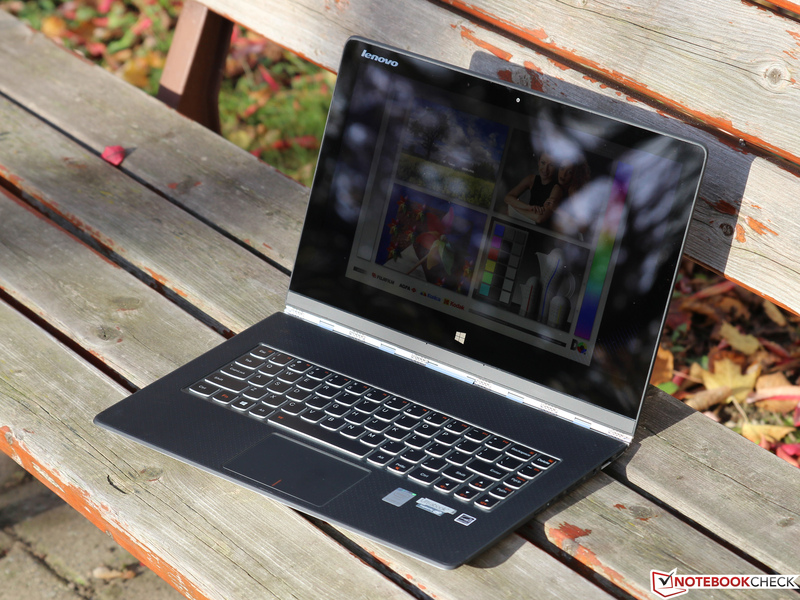 One caveat we should mention: the pixel arrangement, as was the case with the Yoga 2 Pro, is PenTile, which is a lower-cost solution that also conserves power in use. Unfortunately, it does affect image quality, however subtly: text and other items with normally straight edges possess a more jagged appearance up close, and solid colors have a slightly speckled appearance. One does have to be quite close to the panel to truly notice this however. It’s just too bad that, considering its high price, the Yoga 3 Pro couldn’t manage something a bit nicer, such as perhaps an IGZO panel. Our measurements of the display panel reveal an average brightness of 279.6 cd/m², which is good, but not great. Many similarly-sized machines achieve values of 350 cd/m², which makes them easier for use in very bright (e.g. outdoor) environments. Slightly more disappointing is the contrast measurement of 362:1, hampered by a high black value of 0.792 cd/m². These deficiencies are not debilitating in their conspicuousness during typical use, but that’s primarily thanks to what appears to be a very good color gamut (we don’t yet have an ICC profile for this panel but will update our review when available). 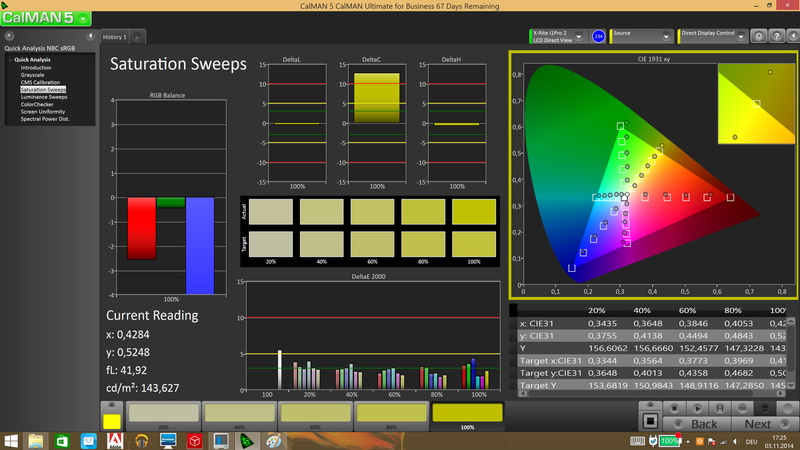 Our measurements of color accuracy via CalMAN 5 provide a good look into the accuracy of the panel’s color reproduction. 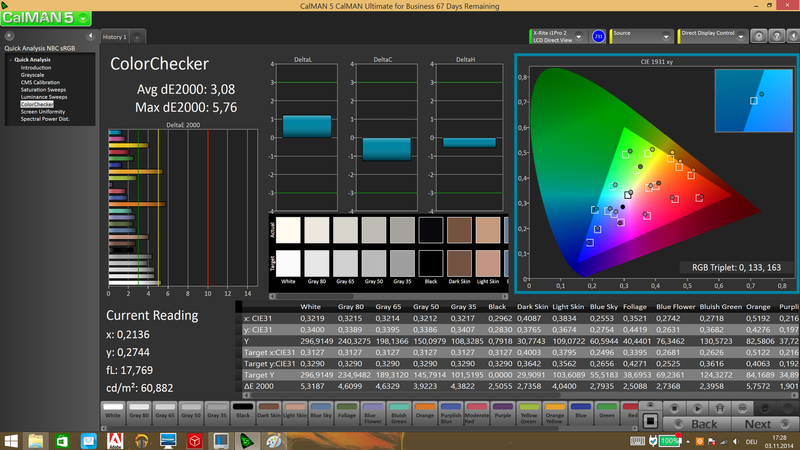 With a grayscale DeltaE average of only 3.36 (ideal: 0) and a ColorChecker DeltaE average of just 3.08 (ideal: 0), accuracies in color representation are nearly indiscernible. This is compounded by the fact that the maximum DeltaE is still only 5.76 (orange), which is a deviation only really noticeable to the trained eye. 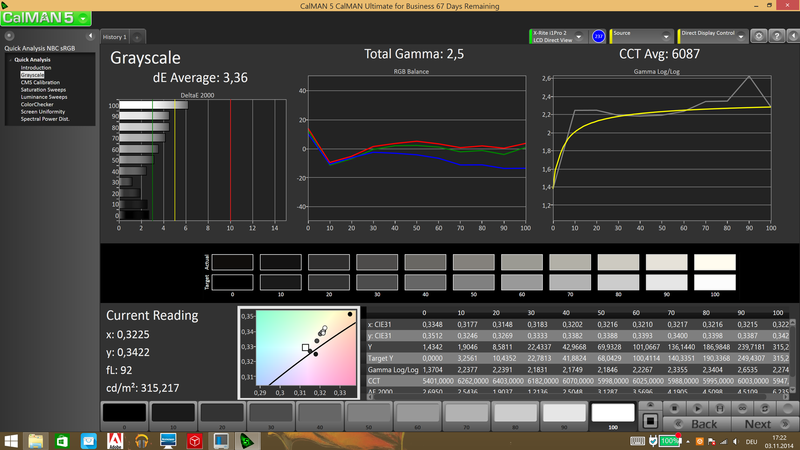 Elsewhere, a total gamma of 2.5 (ideal: 2.2) and CCT Average of 6087 (ideal: 6500) suggest a very nicely-tuned panel. 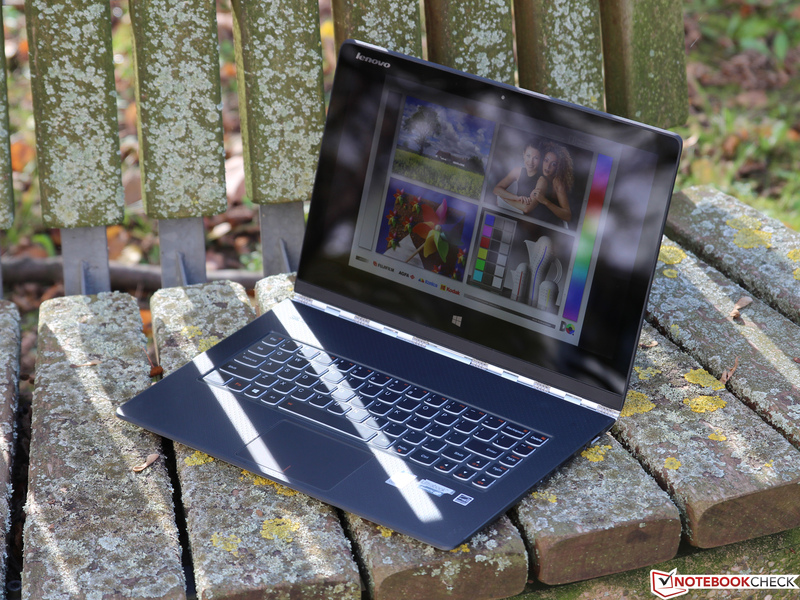 Outdoors, the Yoga 3 Pro struggles much as nearly every other machine outfitted with a high-gloss panel. Reflections rule the day, and the Yoga’s pedestrian brightness of 279.6 cd/m² does little to mitigate. Having said that, comfortable use in the shade is generally possible provided sources of bright light behind the user are kept at a minimum. In terms of viewing angles, the IPS panel looks great from any angle. 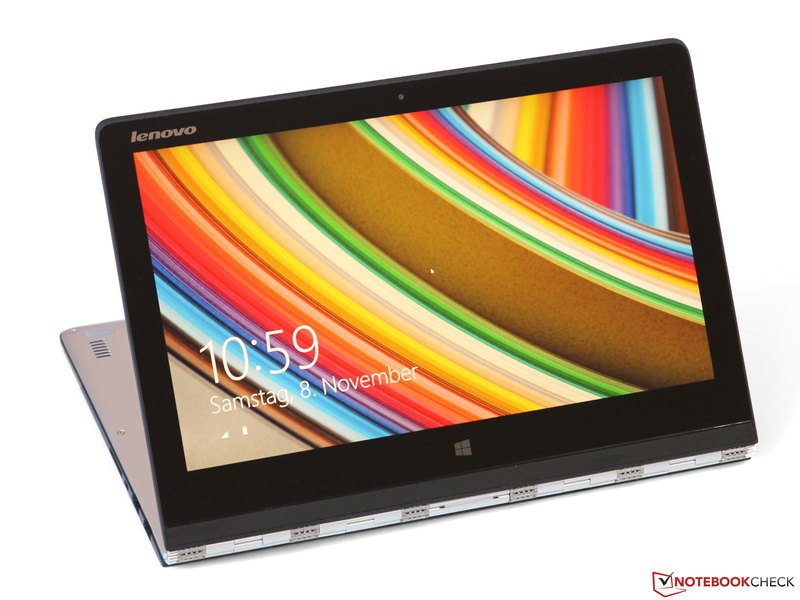 There’s just one processor option available for the Yoga 3 Pro, and it’s a hotly-anticipated one. 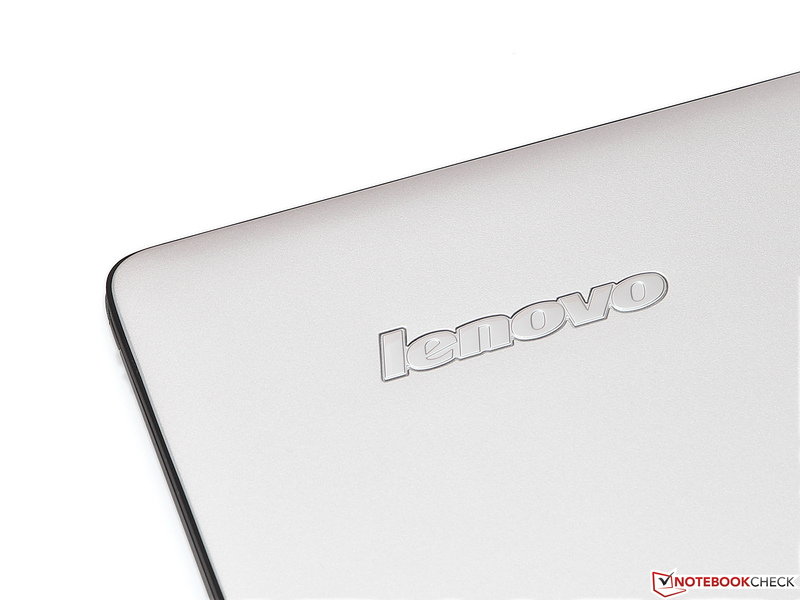 This is one of the first devices to possess an Intel Core M-5Y70 SoC, which features a clock speed of 1.1 – 2.6 GHz. We’re excited to see how it performs in our benchmarks and whether or not it lives up to preliminary expectations. 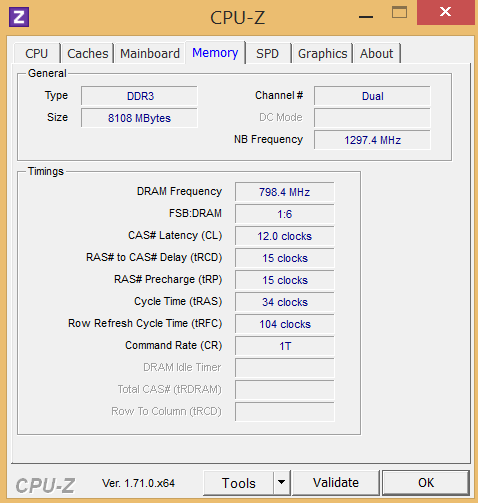 Accompanying this new CPU is 8 GB of dual-channel LPDDR3 1600 MHz RAM, which ought to be enough for most users. That’s fortunate, because the memory is not upgradeable or replaceable: it’s soldered to the board. 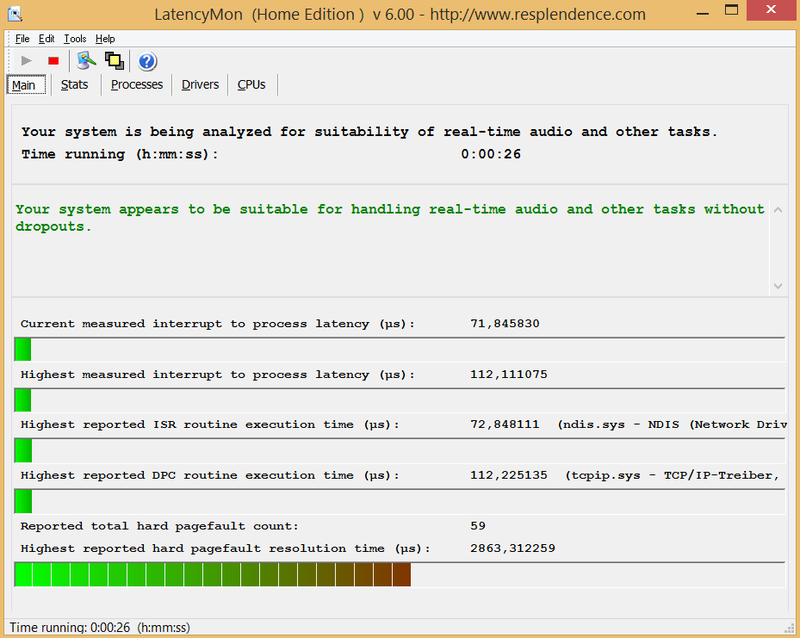 A quick check with LatencyMon revealed no issues with handling real-time audio and other tasks without dropouts. 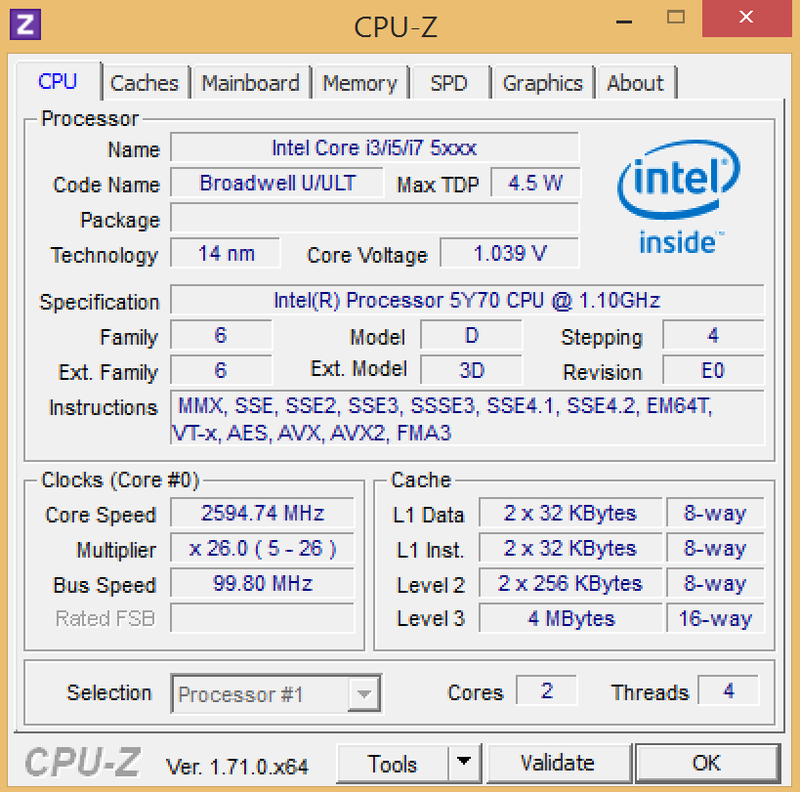 The Intel Core M-5Y70 SoC, again, clocked at 1.1 – 2.6 GHz, is based on the brand-new Broadwell architecture, (manufactured using a 14 nm process) which just recently launched in September 2014. 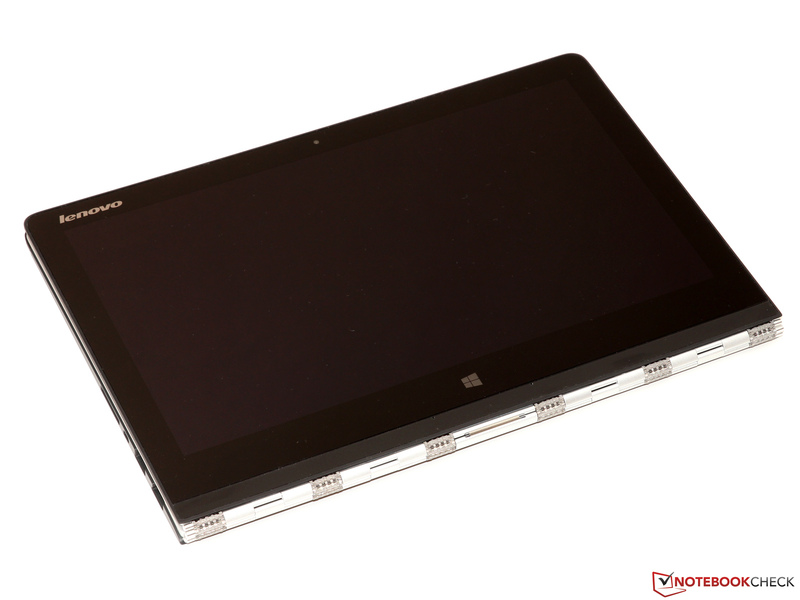 This is an ultra-low voltage dual-core (with HyperThreading) SoC with a TDP of just 4.5 watts, making it a rational choice for razor-thin devices like the Yoga 3 Pro. Comparatively, this is over 10 W leaner than the Yoga 2 Pro’s 15 W TDP Core i5-4200U; however, the comparison isn’t exactly fair, as a closer competitor would be a Haswell Y-series CPU instead. 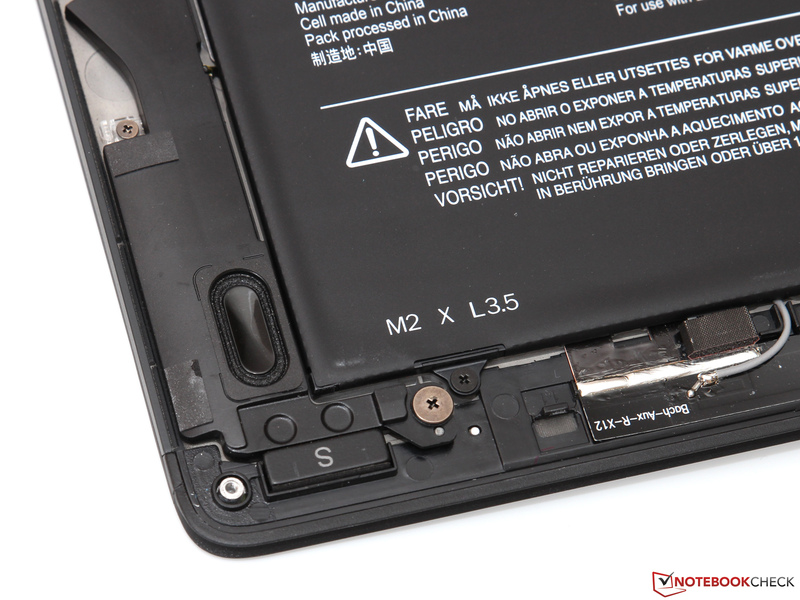 Nevertheless, even those models feature a TDP of 11.5 W, which is 7 W (155%) greater than the M-5Y70. Regardless, Intel still promises solid performance in spite of this drastic reduction in power consumption—a claim we are eager to test via our benchmarks today. 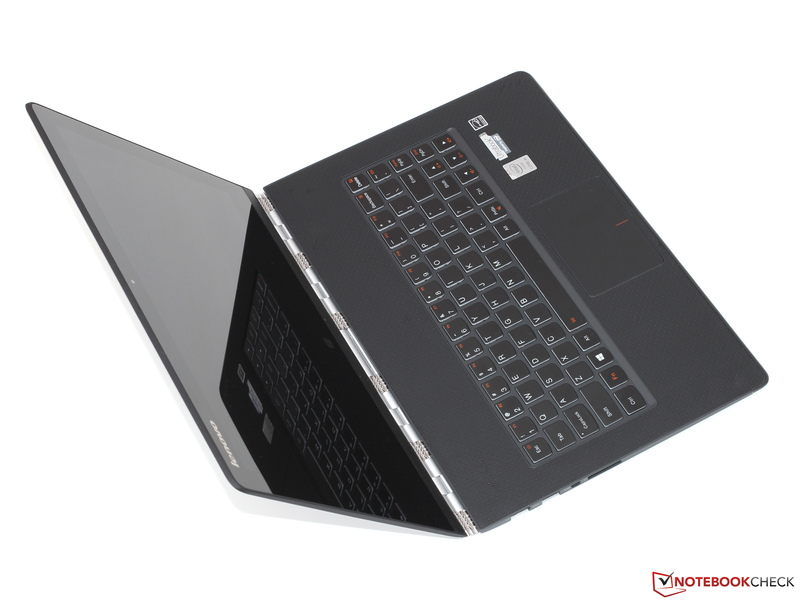 It’s difficult to choose an accurate comparison of the M-5Y70 amongst its predecessors as one doesn’t really exist. 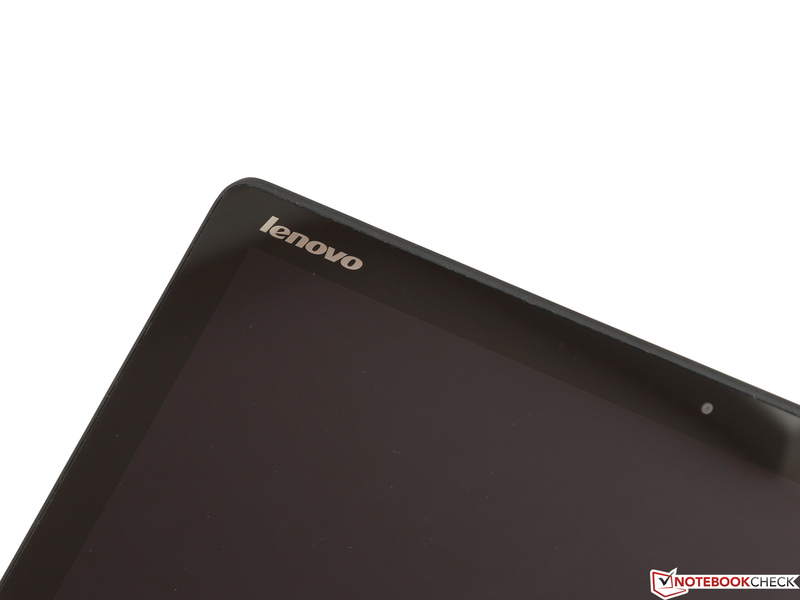 The CPU ought to perform comparably to the Intel Core i5-4200U that the Yoga 2 Pro featured in short benchmarks, but as the duration of the test increases its performance is likely to diminish due to significant TDP constraints. 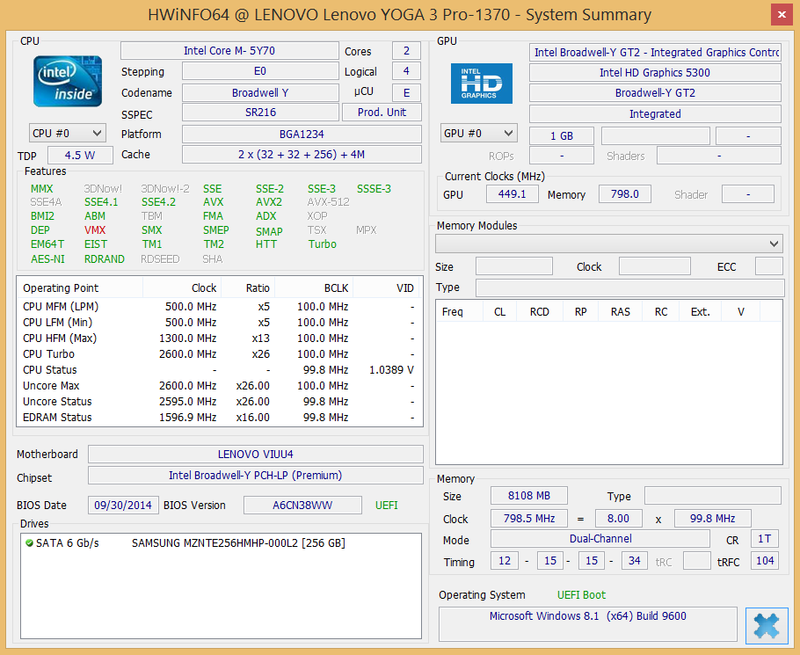 Indeed, in Super Pi mod 1.5 XS 1M and wPrime 32M, we found results of 14.6/19.3 seconds from the Yoga 3 Pro versus 15/22.9 seconds from the Yoga 2 Pro (lower is better). 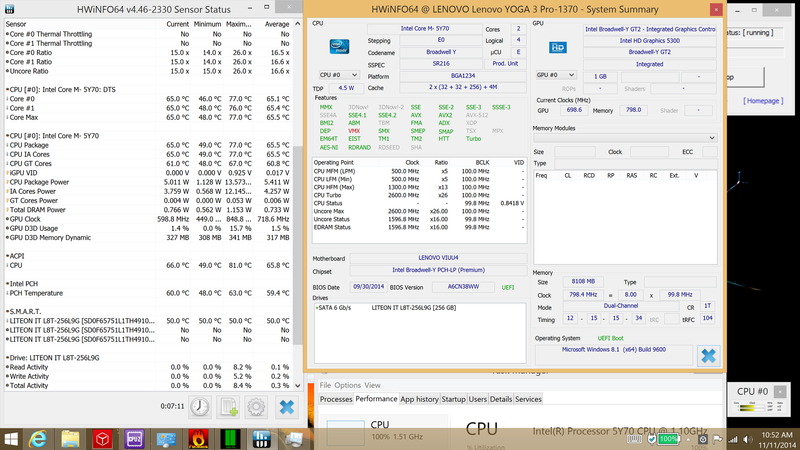 But stepping up to longer benchmarks sees the advantage evaporate: in Super Pi 32M and wPrime 1024M, we recorded 837/981 versus 804/726 seconds, a reversal of fortunes for the Yoga 3 Pro. 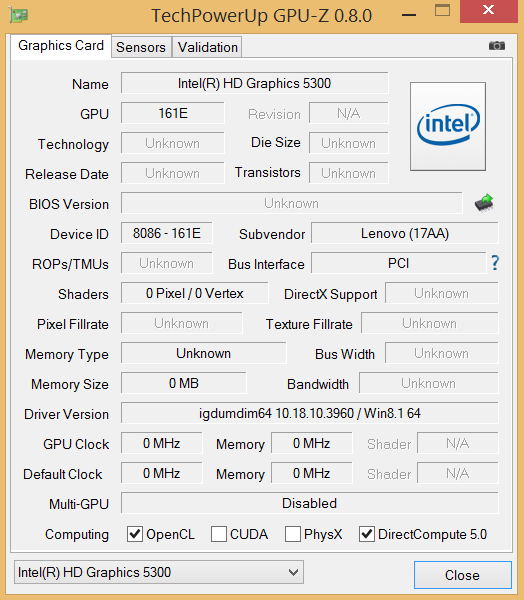 This same theme holds true across all relevant benchmarks and even extends into GPU performance (which we’ll cover later), and while it might be a concern for those seeking great sustained performance, that really just isn’t what the Yoga 3 Pro—or more specifically the Intel Y-series Broadwell chips—are about. Instead, Intel (and Lenovo) are betting that users will not find much need for class-leading sustained performance in the Ultra-thin notebook segment, and so they are instead focusing on power efficiency and portability in exchange for heavy-duty processing performance. In light of this, the very good short-term CPU performance is actually pretty impressive and will likely serve well in practical use. We synthetically measure system performance using PCMark. 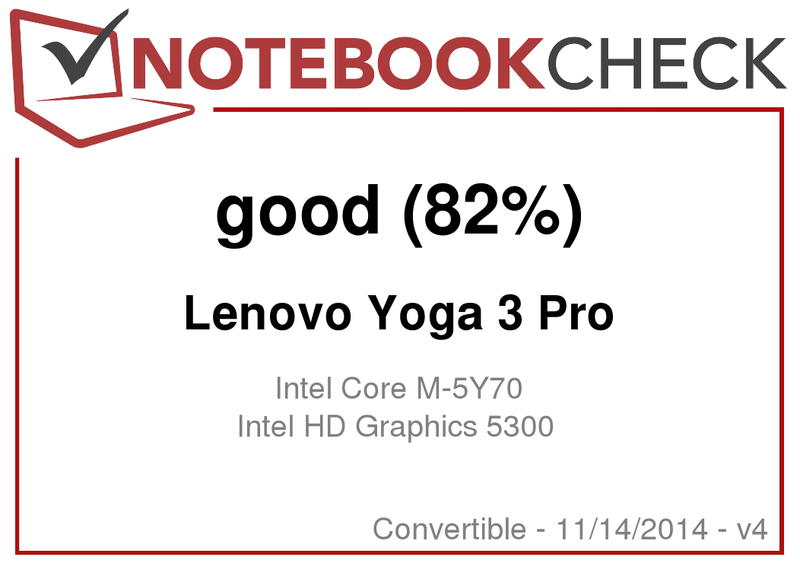 The Yoga 3 Pro’s PCMark 7 score of 4650 (versus the Yoga 2 Pro’s 4670) and a PCMark 8 score of 2633 helps support the notion that, as touched upon above, having the fastest CPU really doesn’t translate to that much additional perceived general computing speed these days. Moreover, our subjective impressions of the Yoga 3 Pro’s performance corroborate these results; we rarely found ourselves waiting for anything to take place, and program launches, startup, shutdown, and sleep/resumption functioned quickly and smoothly throughout our time with the device. When it comes to general performance, far more important than processor selection (beyond the bottom rung of candidates anyway) is a capable and nimble storage device. 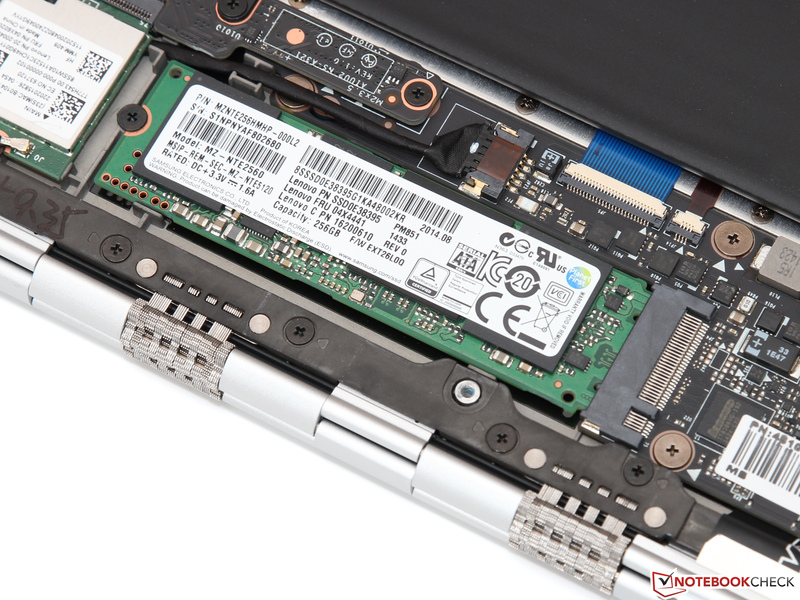 The Yoga 3 Pro recognizes this with the inclusion of a very fast Samsung 256GB PM851 M.2 SSD (some other units have been reported to ship with a LiteOn L8T-256L9G, but similar performance can be expected from either). We recorded sequential read/write speeds of 482.43 MB/s and 229.1 MB/s in AS SSD respectively, as well as 528.9 MB/s and 242.1 MB/s in those same tests in CDM 3.0. 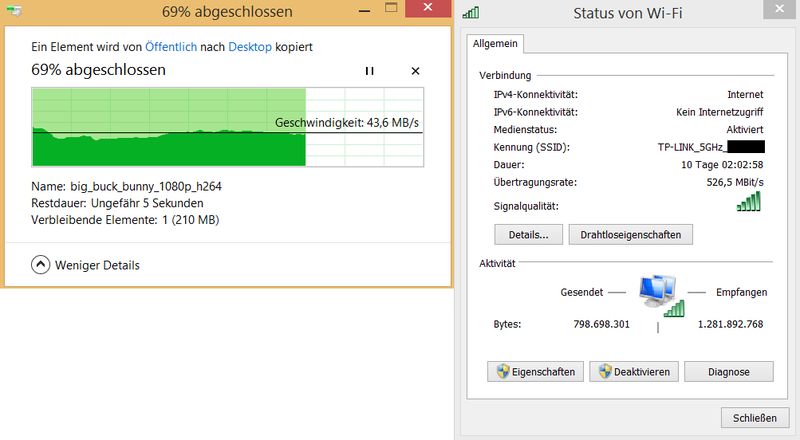 This isn’t the best write performance we’ve seen, but the drive is nevertheless extremely fast in general operation. The 4K QD32 performance, meanwhile, is very good. 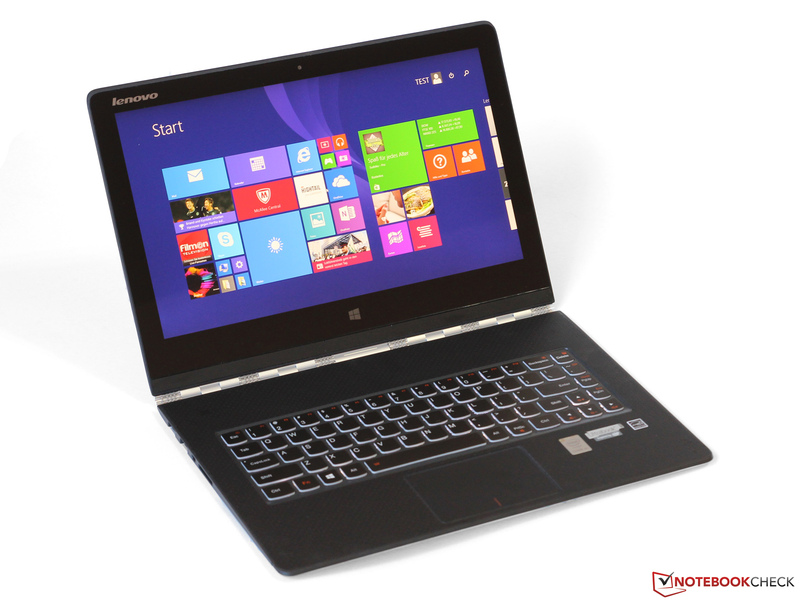 The Yoga 3 Pro’s Intel Core M-5Y70 includes HD Graphics 5300 clocked at 100 – 850 MHz. As with the CPU, heavy-duty GPU performance isn’t the focus of the Yoga 3 Pro or its chipset, and as such, we should expect seriously inhibited performance in long-winded benchmarks, especially those which stress both CPU and GPU simultaneously (due to heavy TDP constraints). Such is the case in our synthetic benchmarks, though the results weren’t pitiful by any means: we received a 3DMark 11 score of 756 (versus the Yoga 2 Pro’s 897) and a 3DMark (2013 edition) Ice Storm score of 22374. For a more realistic sense of the machine’s graphical prowess, we also subjected it to a flurry of gaming benchmarks, which you can find detailed in the table below. The theme is the same throughout: if playable at all, games must be held to the lowest possible settings and resolution. 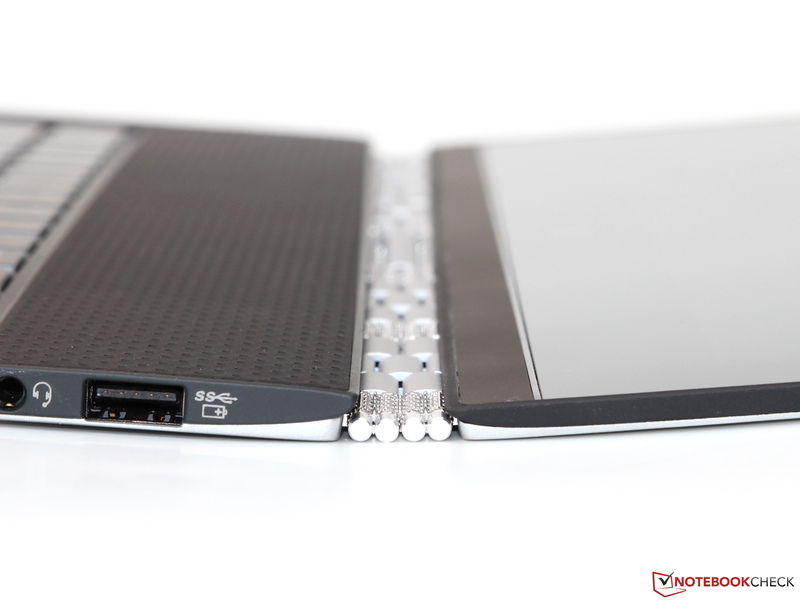 The Yoga 3 Pro just plain isn’t meant for that sort of use. 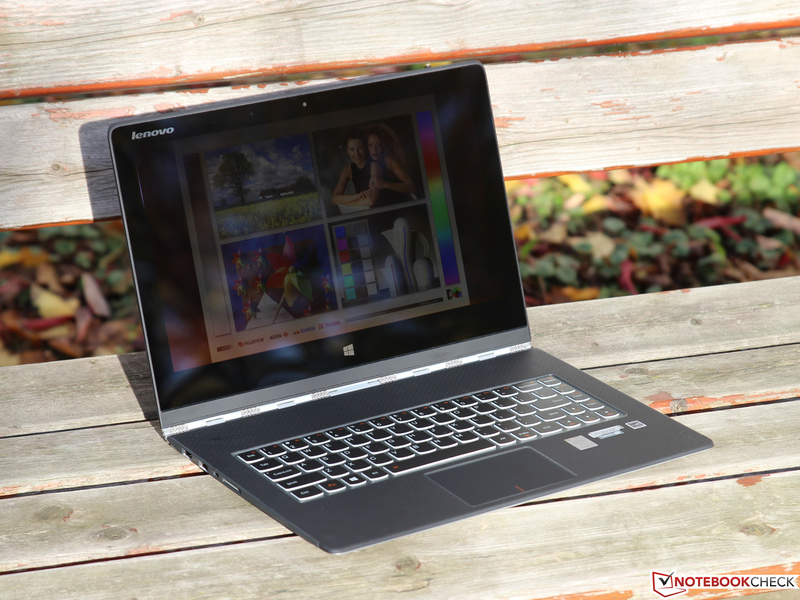 To call the Yoga 3 Pro quiet would be an understatement. Though it is indeed actively-cooled, you would hardly know it in general use without spending time with it in near-silence. We measured idle noise levels of between 28.9 and 30.1 dB(A)—barely audible, if at all. This is nothing unusual, but the load measurements of 31.5—31.9 dB(A) are. That’s only marginally louder than the unit is while idle, and it’s still below the threshold of what most people would consider detectable noise levels in common environments. So what does this mean for the unit’s temperatures, then? 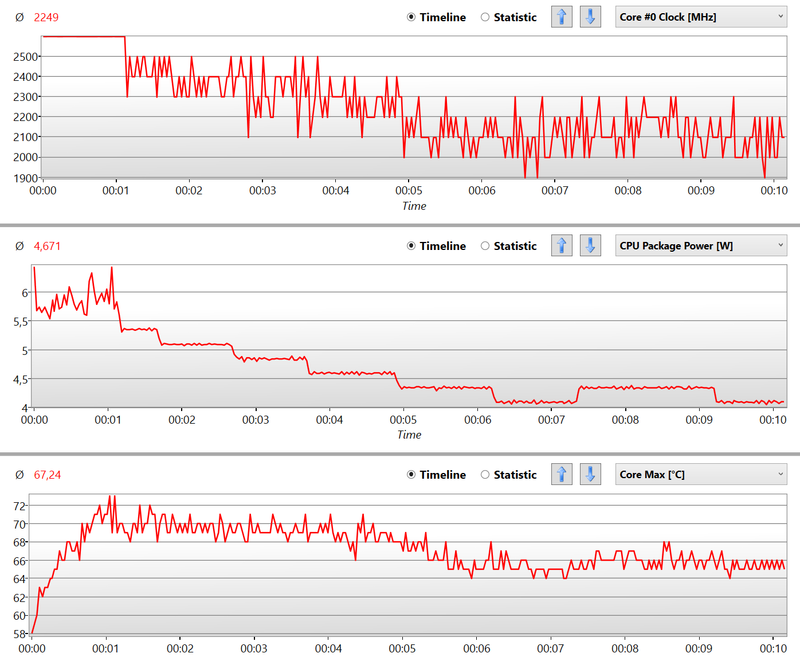 Fortunately, the Core M-5Y70’s 4.5 W TDP pays dividends in terms of thermal management, as even while under load, we only recorded average temperatures of 31.7 °C and 30.3 °C on top and bottom, respectively, with the single hottest point reaching just 42.1 °C in the upper-right corner of the top of the base unit (the bottom of the machine remains comfortable at only 37 °C maximum). As you might predict, things were considerably cooler than that while idle, where we saw average temperatures of 28.9 °C / 28.2 °C (top/bottom). The Broadwell Y-series chips were designed so that they could survive even in passively-cooled situations, and this should be evidence enough of that capability. 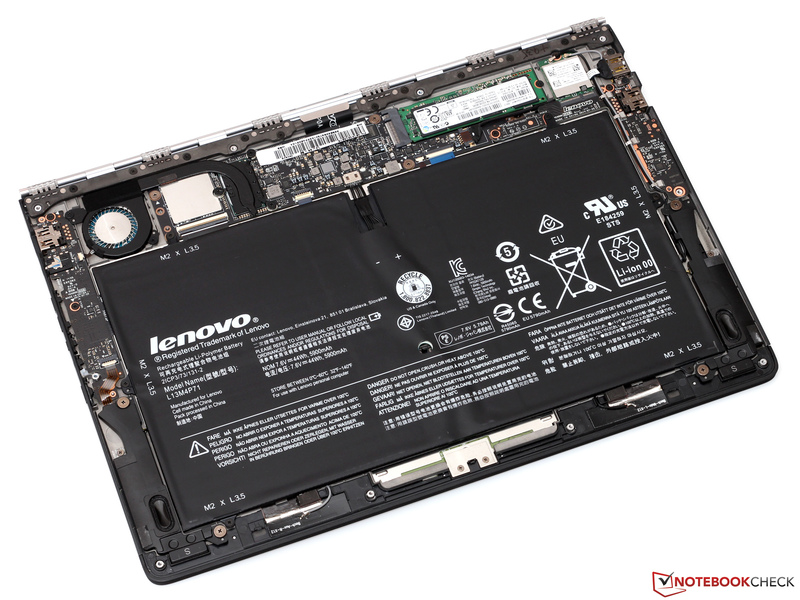 Yes, the Yoga 3 Pro does feature a cooling fan, but it’s a very subtle and conservative one in comparison to its predecessors. 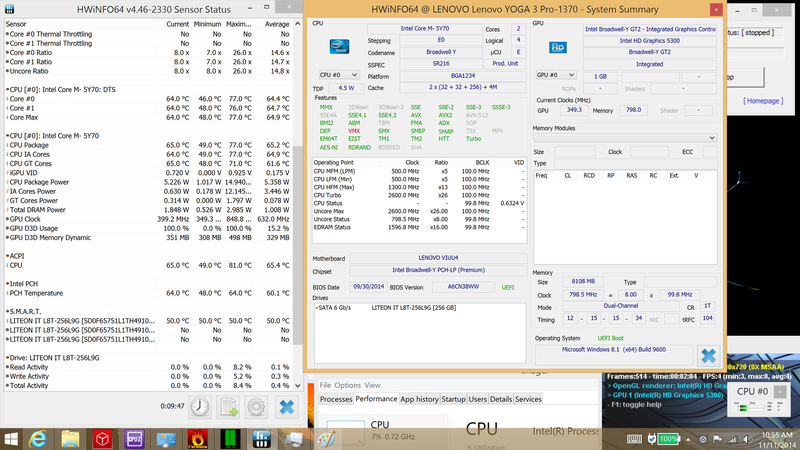 As usual, we subjected the Yoga 3 Pro to our stress testing routines, which involve full simulated CPU stress, GPU stress, and finally, combined stress, with the help of FurMark and Prime95. We should preface this section with a note reiterating our predictions: thanks to an incredibly low 4.5 W TDP, we can’t expect much from the Yoga in this section, regardless of the efficiency strides made by Broadwell. There’s just only so much that can be accomplished before the power consumption limitations kick in. 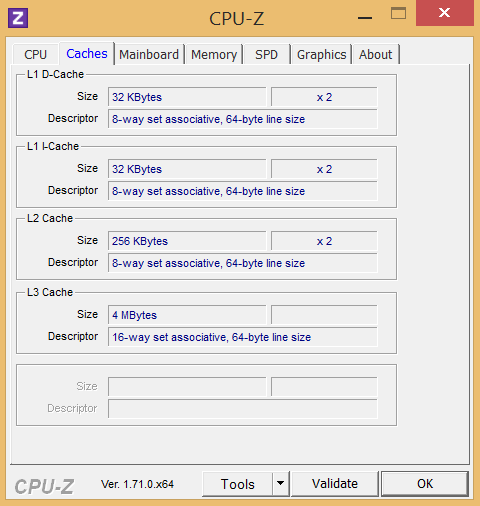 Even during CPU stress alone, the machine quickly buckles, reaching a resting CPU frequency of around 1.6 GHz. Since this frequency is still above the SoC’s base clock rate of 1.1 GHz, this doesn’t technically qualify as throttling. Nonetheless, this is far below the maximum burst frequency of 2.6 GHz (which is only achieved briefly near the start of the testing), and it quickly confirms our earlier reasoning as to why we witnessed a drop-off in benchmark scores during longer testing routines. Temperatures nonetheless remain reasonable with a stable reading of around 65 °C after bumping up against 77 °C earlier in the test period. 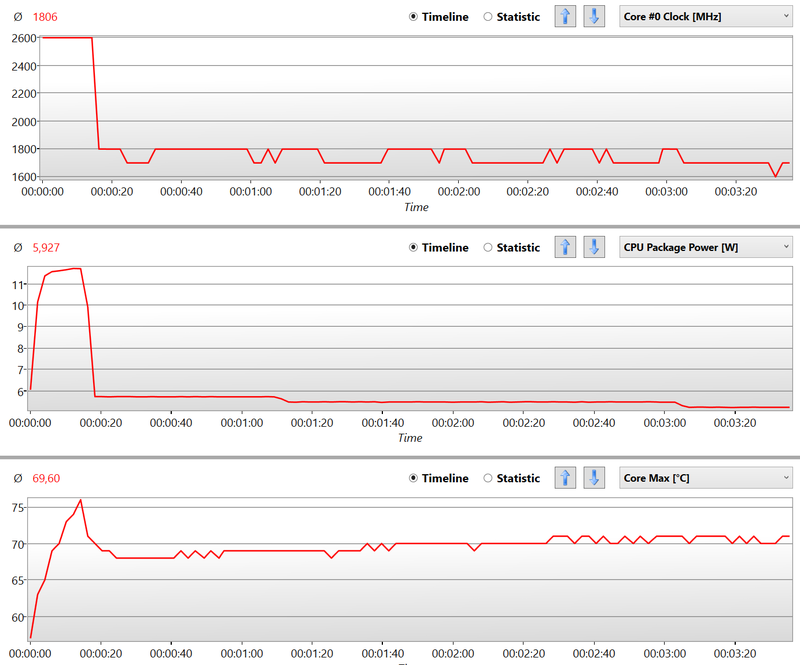 GPU stress brings a similar kind of pain, with stable frequencies of just 350 MHz achievable after only a short while. Again, the maximum clock rate of 850 MHz is a fleeting occurrence, as the machine is hampered primarily by TDP. Temperatures again rest at around the same level (64 °C in this case). 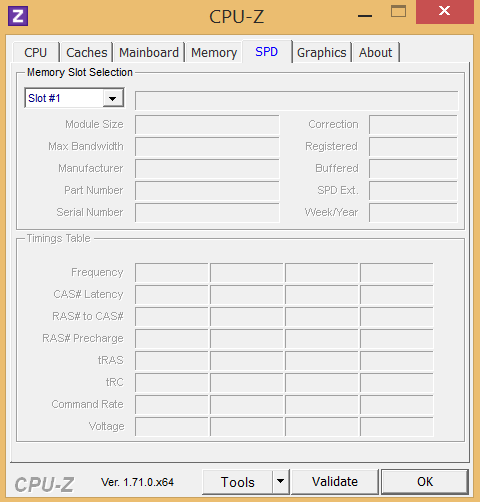 Finally, combined CPU and GPU stress wreaks predictable havoc on the machine, with CPU clock rates of around 500-600 MHz and the GPU reaching only around 300 MHz. 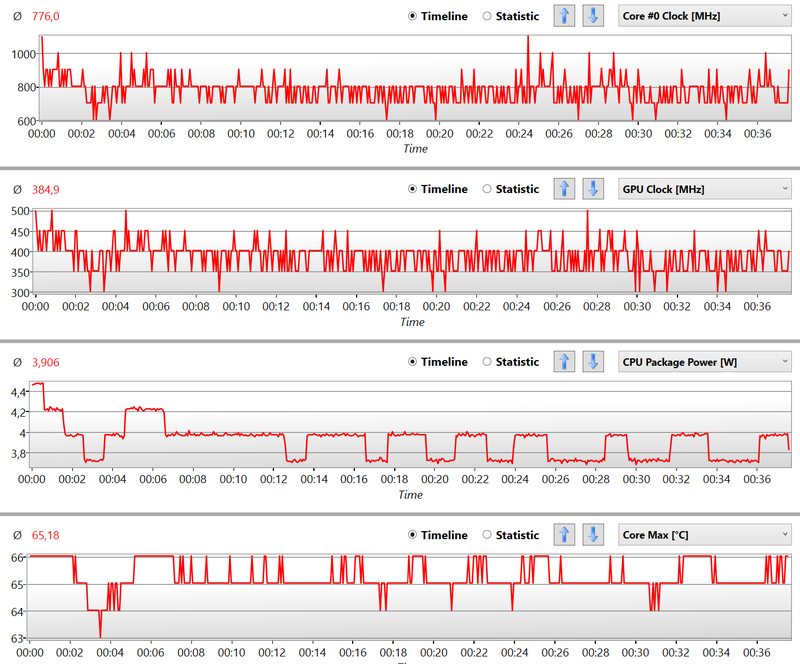 Yet again, temperatures seem to be unrelated to this performance limitation, resting at around 66 °C. We can finally classify this as throttling, since the CPU consistently remains below its base clock rate of 1100 MHz in this scenario. 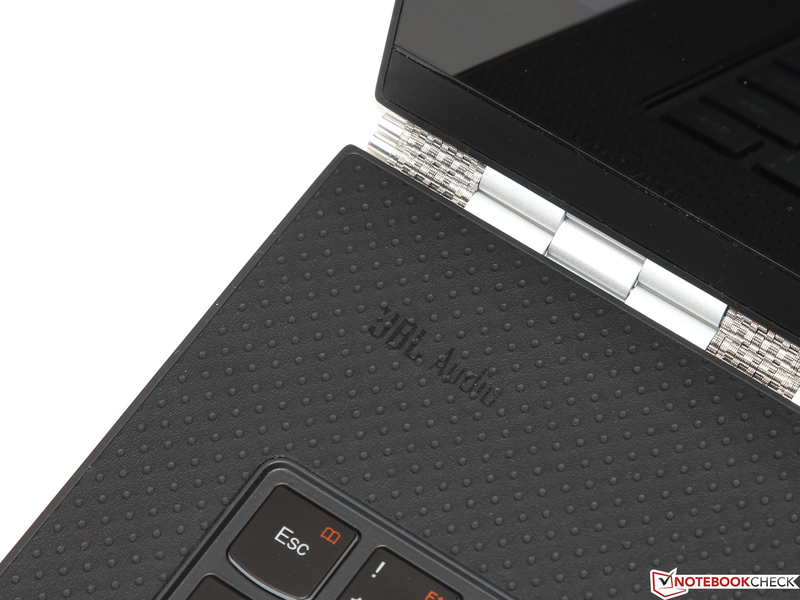 Although observant consumers will notice a “JBL Audio” logo emblazoned within the notebook’s rubbery base cover, the Yoga 3 Pro’s bottom-mounted speakers have to contend with an insanely slim case in their quest for acceptable audio reproduction. Fortunately, they achieve the basics: loud enough sound for general use with reasonable clarity, though a lack of low-frequency reproduction is practically a given. In light of the lower-power SoC, we hope to see improved power consumption leading to what is also hopefully better battery life. 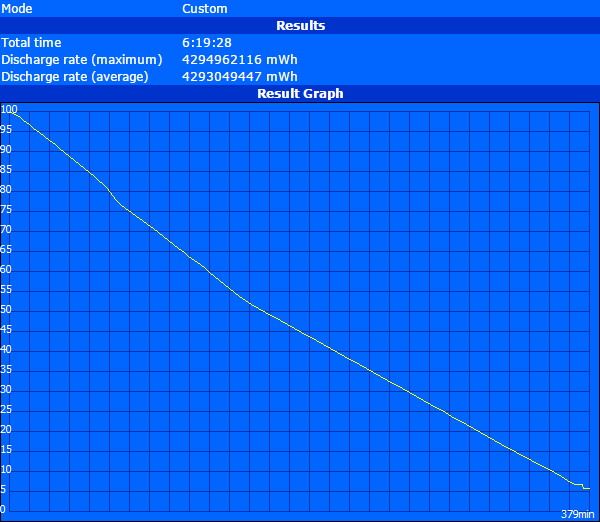 Our power consumption measurements show an idle drain of 8.9 watts, with a peak of 10.7 watts. This is actually slightly higher than that of the Yoga 2 13, but that discrepancy may be partially explained by the fact that it features a considerably lower-resolution (and still PenTile) LCD panel (1080p). 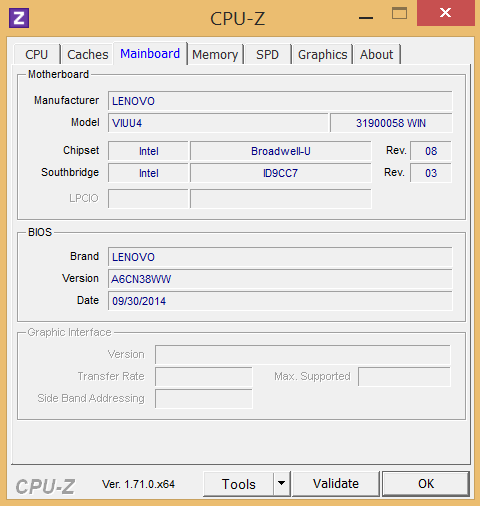 Still, we would have expected the new Broadwell Y-series chips to have a more significant effect while idle. On a brighter note, the low-end idle power consumption (brightness minimum, wireless radios off) is down to 3.7 W from 5.1 W, which should benefit our results in the Readers Test. Meanwhile, load usage is another story entirely. Here, we only recorded power consumption of 22 W during our run of 3DMark 06, whereas throttling limited max load power consumption to an even lower 19.5 W. That’s nearly half that of the Yoga 2 13, which consumed 35.9 W under load (42.3 W maximum). This is most certainly a consequence of the Yoga 2 13’s CPU featuring a 15 W TDP, whereas the Yoga 3 Pro’s is again a mere 4.5 W. And yet again, this is even considering the presumed higher power demands of the Yoga 3 Pro’s sharper screen. In spite of these efficiency improvements, the size of the battery has seen a 19% drop in capacity, slipping from 54 Wh to just 44 Wh (5900 mAh). What are the effects on the machine’s battery life? Fortunately, the Yoga 3 Pro manages positive gains, though the results are nothing breathtaking. Whereas the Yoga 2 13 lasted only 5 hours and 2 minutes while surfing with Wi-Fi, the Yoga 3 Pro did a much better job with 6 hours and 19 minutes (a gain of over 20%). 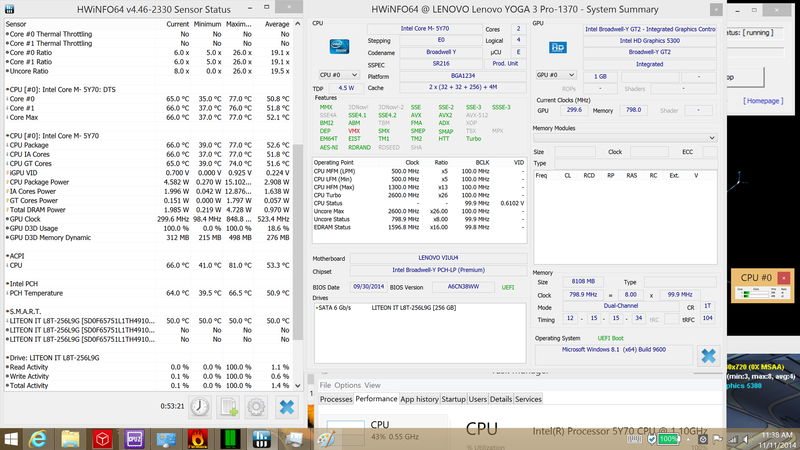 This also beats the Yoga 2 Pro’s result of 5:35, which we called “far below that of many other modern Ultrabooks”. Disappointingly, this improved longevity is still nothing in comparison to the best Ultrabooks available today; the MacBook Air 13 managed 8:35 in the same test, and the Dell XPS 13-9333 lasted for 7:45. Battery life under load is, as predicted by our power consumption measurements, far above that of its predecessors (at 2:41), though again, sustained performance is notably lower in exchange. Finally, our Readers Test (maximum battery life) produced a result of 10:35, which jives with the lower minimum idle power consumption we measured. Broadwell’s first public appearance didn’t quite sweep us off our feet, with wider clock rate ranges and more conservative top-end power consumption encompassing most of the practical advancements. 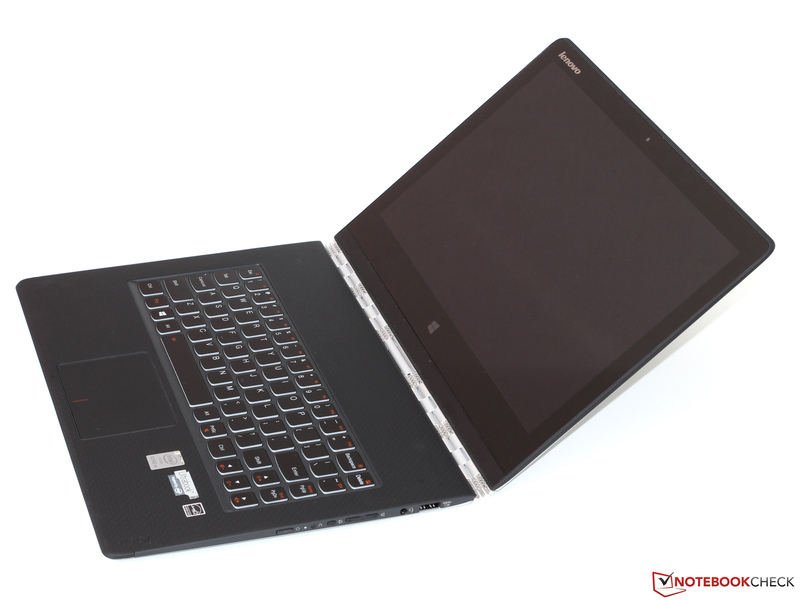 Nevertheless, these efficiency improvements have allowed the Yoga 3 Pro to impress from the outset with a knockout case design that is incredibly lightweight and impossibly thin, all without devolving into tablet-grade performance territory. 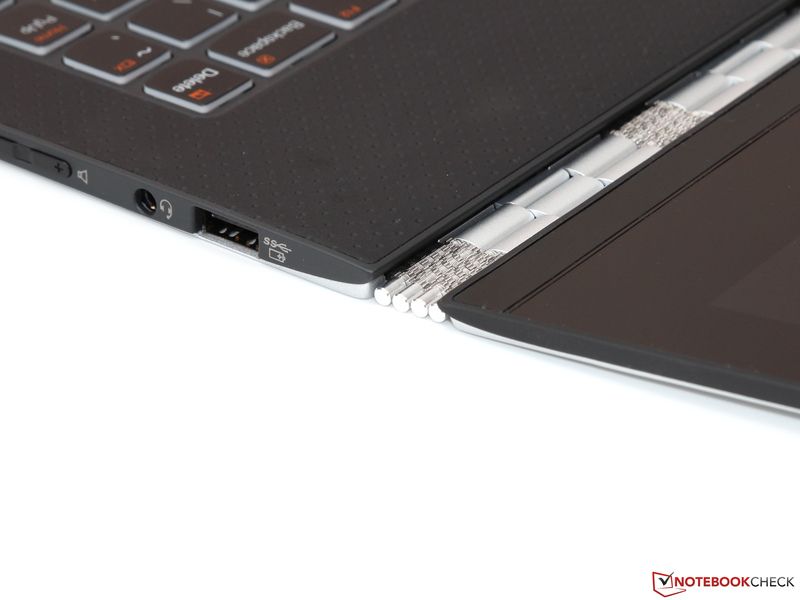 Also to thank for this breakthrough in portability is the novel watchband-style hinge design and a tiny and unobtrusive cooling system featuring exhaust and intake vents integrated into the hinge—all crammed into the small space just above the keyboard. It’s amazing that under these circumstances the machine remains cool throughout use, though the performance constraints we observed under sustained load are largely responsible for that achievement. 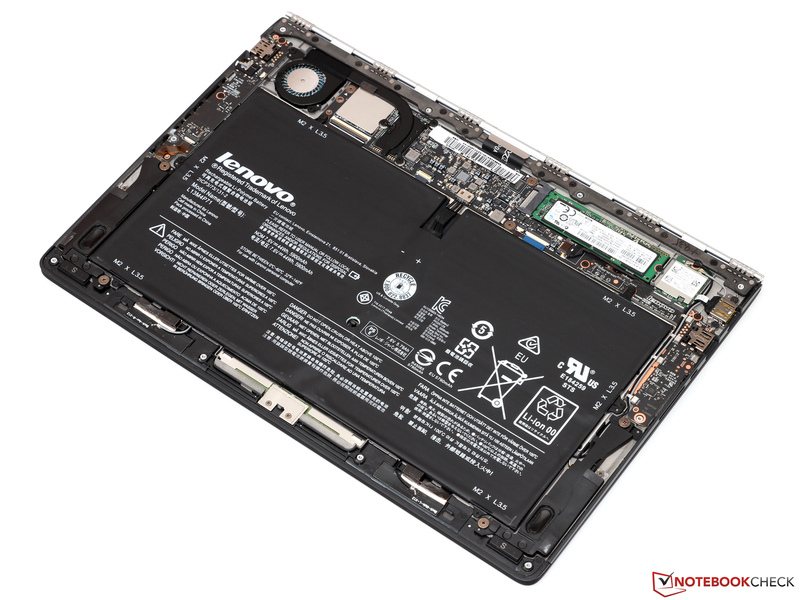 Although one might think that such self-imposed power consumption limitations, coupled with the improved efficiency of the Broadwell chipset, would result in wildly better battery life, we instead find only modest gains in the category thanks to a battery shrink to 44 Wh (down from 54 Wh in the Yoga 2 Pro) to help realize the dream of such a ridiculously slim and light device. Our synthetic benchmarks and stress testing also reveal the Yoga 3 Pro’s subtle regression from its predecessor’s already unremarkable processing power—but fortunately, these findings don’t pan out tangibly in everyday use. Instead, our general application performance measurements communicate a very snappy machine with little reason to keep its user waiting during typical use. Indeed, we never found ourselves ruing the machine’s lack of benchmarking superiority throughout our time with it; thanks to a balance which includes a very fast SSD and ample RAM (8 GB), the CPU really is just powerful enough 95% of the time. 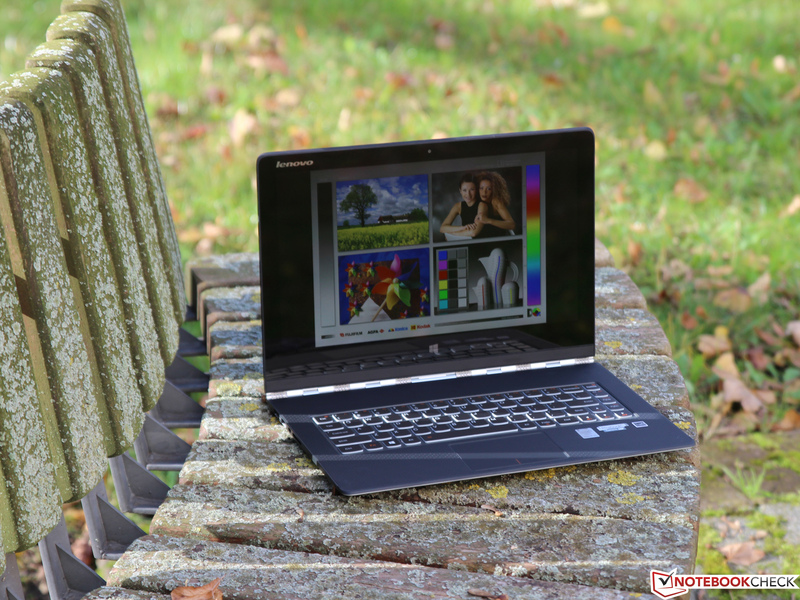 Sure, it’s always nice to have the added headroom for those unexpected tests in processing prowess (such as a video editing or short gaming session), but that’s just not what the Yoga 3 Pro is about. Still, there are other things we wish we could change about it. Six hours of battery life under simulated everyday use is acceptable, but it’s at least 25% below that of many other top-end competitors in the same class. The lid is difficult to open, even with two hands. And then there’s the screen: the high-resolution QHD+ panel features vivid color reproduction and plenty of real estate, but brightness and contrast are lacking, and the cost-saving PenTile pixel arrangement once again produces jagged and speckled distortions in ways we’d expect not to see for a $1,300 machine. That’s the last major complaint: price. While the Yoga 3 Pro certainly looks and feels premium, its caveats in the realm of battery life and display technology might suggest a lower asking price. Then again, there are also not really any direct competitors (yet), as the dimensions and weight of the machine are well below any comparable contender. Forgiving these primary grievances, the Yoga 3 Pro truly is a notebook which leverages balance to achieve utility greater than the sum of its parts. For that reason, anyone considering a convertible notebook this holiday season would be wise to include it on their list of candidates. 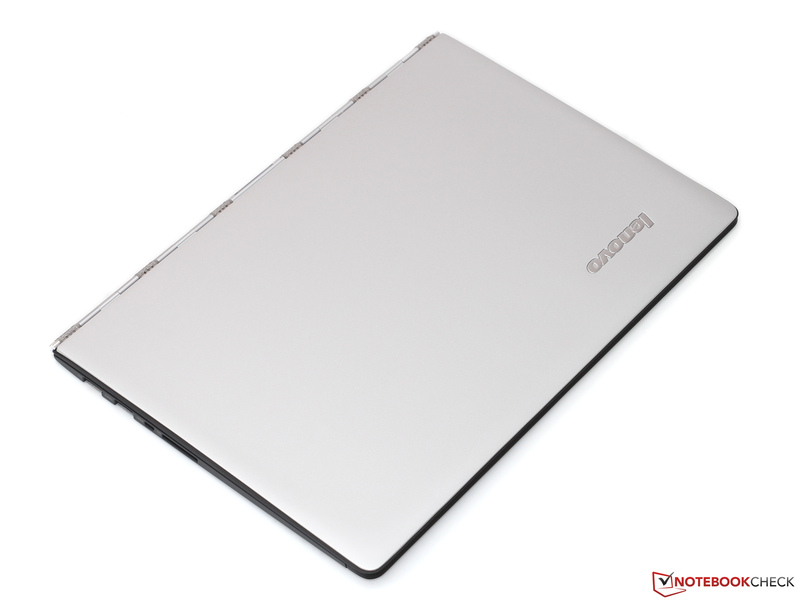 In Review: Lenovo Yoga 3 Pro. 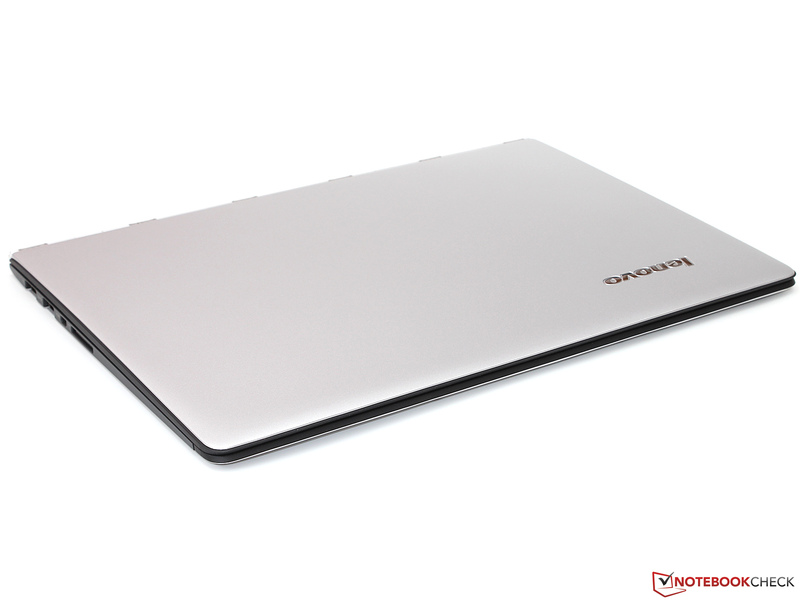 Test model courtesy of Lenovo US. This is certainly the most stylish Yoga yet. ...is unlike anything we've seen before. 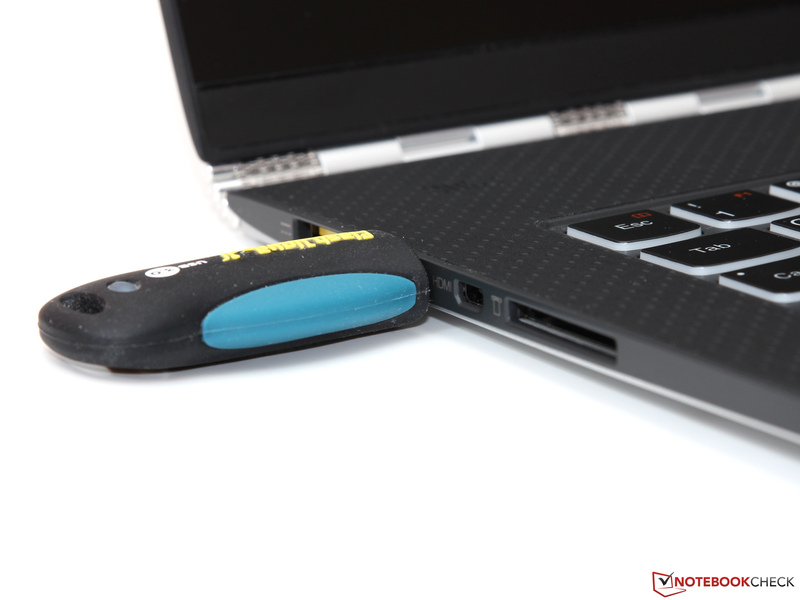 Larger USB devices lift the machine off the surface. ...but at least once inside nearly everything is accessible.